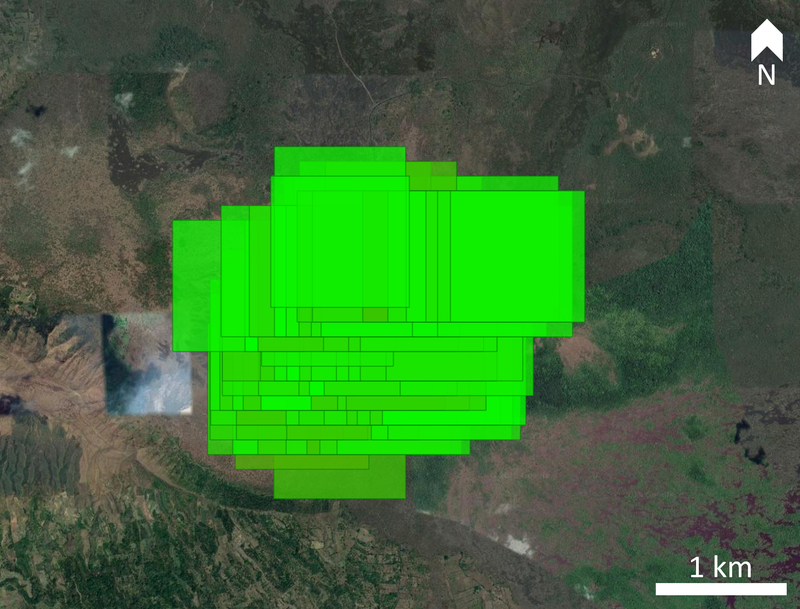 Near-daily explosions produce 1-km-high ash plumes and incandescent blocks on all flanks, October 2017-March 2018. 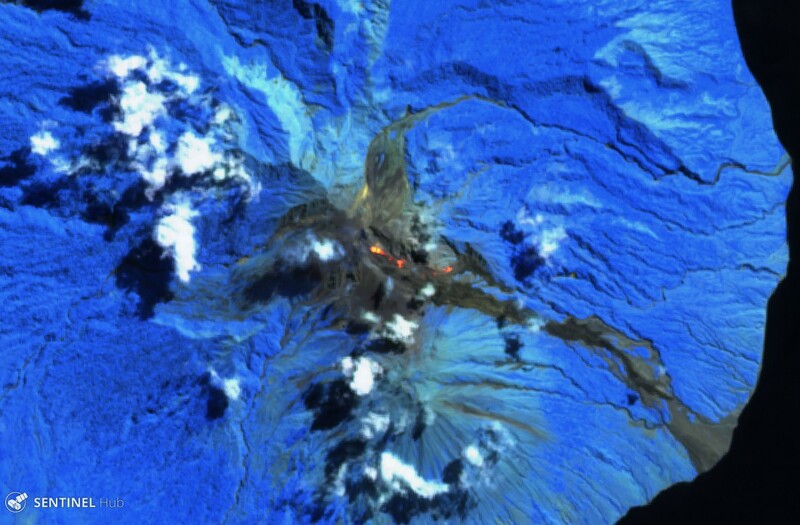 Bagana is a relatively remote volcano on Bougainville Island that is poorly monitored except by satellite. 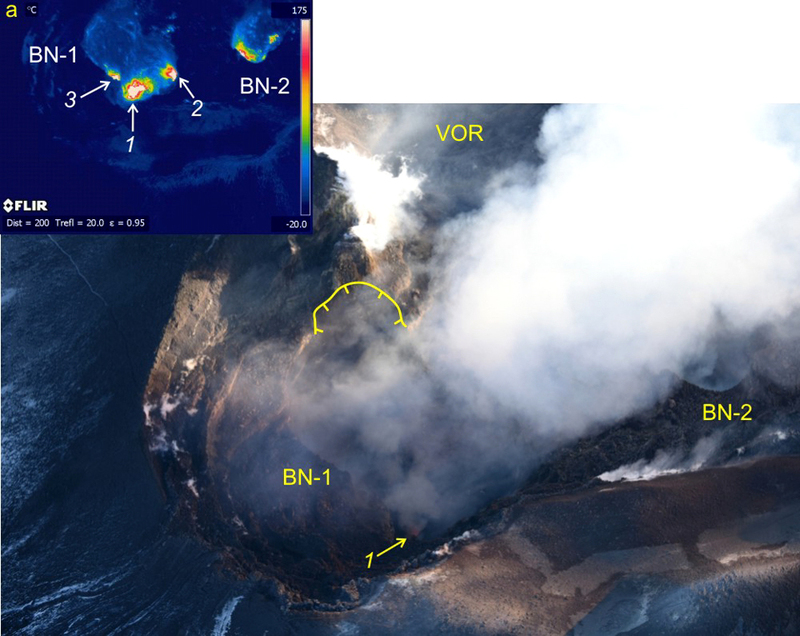 The most recent eruptive phase began on or before early 2000 with intermittent ash plumes and thermal anomalies (BGVN 41:04, 41:07, 42:08). During the period 13 June 2017-15 April 2018, this same pattern of activity continued. Intermittent ash plumes rose to 2.1-2.4 km altitude (table 6). Plume activity was especially elevated during August 2017. Satellite data indicate that both plume activity and thermal alerts had decreased markedly by the beginning of March 2018. Table 6. Summary of ash plumes from Bagana reported during 14 June 2017-15 April 2018. Courtesy of the Darwin Volcanic Ash Advisory Centre (VAAC). Thermal anomalies, based on MODIS satellite instruments analyzed using the MODVOLC algorithm, were observed 0-3 days each month during June-November 2017, seven days in December 2017, one day in January 2018, and two days in February 2018. More than two pixels were recorded on 4-5 and 9 December (up to five pixels), 31 January (4 pixels), and 4 February (5 pixels). 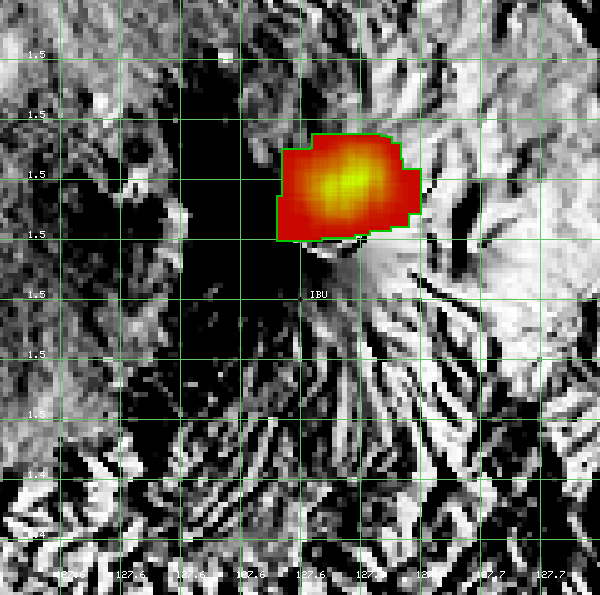 The MIROVA (Middle InfraRed Observation of Volcanic Activity) volcano hotspot detection system, also based on analysis of MODIS data, recorded a moderate number of thermal alerts within 5 km of the volcano from June through late November 2017, except for a decrease between mid-September and mid-October (figure 29). Activity rose sharply during the end of November through early December and again during the first half of January before tapering off, a pattern inconsistent with the reported ash plumes. Few hotspots were detected between mid-February through 15 April, a pattern consistent with the MODVOLC data. Figure 29. 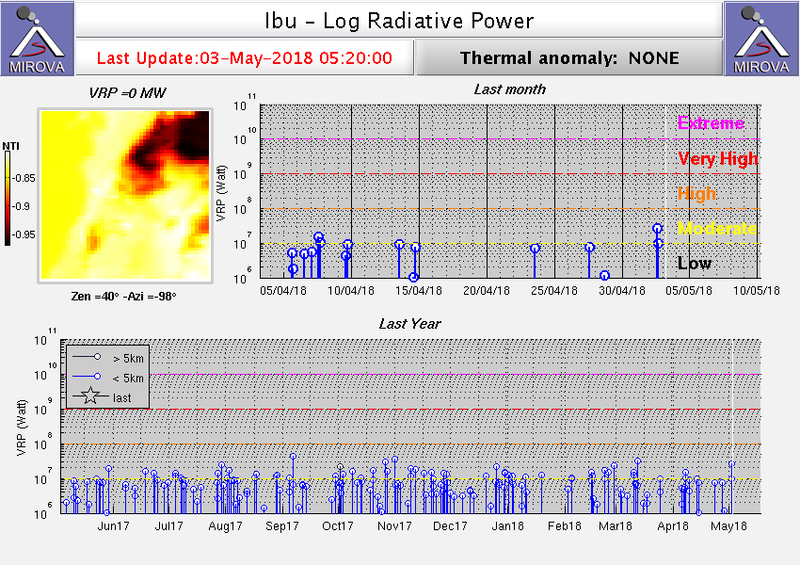 Thermal anomalies at Bagana shown on a MIROVA plot (Log Radiative Power) for the year ending 27 April 2018. Courtesy of MIROVA. Sulfur dioxide anomalies since June 2016 above 2.5 Dobson Units (Ozone Monitoring Instrument, OMI) or above 1.6 Dobson Units (Ozone Mapping and Profiler Suite, OMPS) occurred in 2016 on 4 and 6 July, 10-11 October, 11 November, and 3 December. Similar emissions were detected in 2017 on 30 January, 3 and 19 March, 15 April, 5 August, and 2 and 7 December. The satellite data showed high levels of SO2 in 2018 on 8 and 24 February, and 29 March. Information Contacts: Darwin Volcanic Ash Advisory Centre (VAAC), Bureau of Meteorology, Northern Territory Regional Office, PO Box 40050, Casuarina, NT 0811, Australia (URL: http://www.bom.gov.au/info/vaac/); MIROVA, a collaborative project between the Universities of Turin and Florence (Italy) supported by the Centre for Volcanic Risk of the Italian Civil Protection Department (URL: http://www.mirovaweb.it/); Hawai'i Institute of Geophysics and Planetology (HIGP) - MODVOLC Thermal Alerts System, School of Ocean and Earth Science and Technology (SOEST), Univ. of Hawai'i, 2525 Correa Road, Honolulu, HI 96822, USA (URL: http://modis.higp.hawaii.edu/); NASA Goddard Space Flight Center (NASA/GSFC), Global Sulfur Dioxide Monitoring Page, Atmospheric Chemistry and Dynamics Laboratory, 8800 Greenbelt Road, Goddard, Maryland, USA (URL: https://so2.gsfc.nasa.gov/). 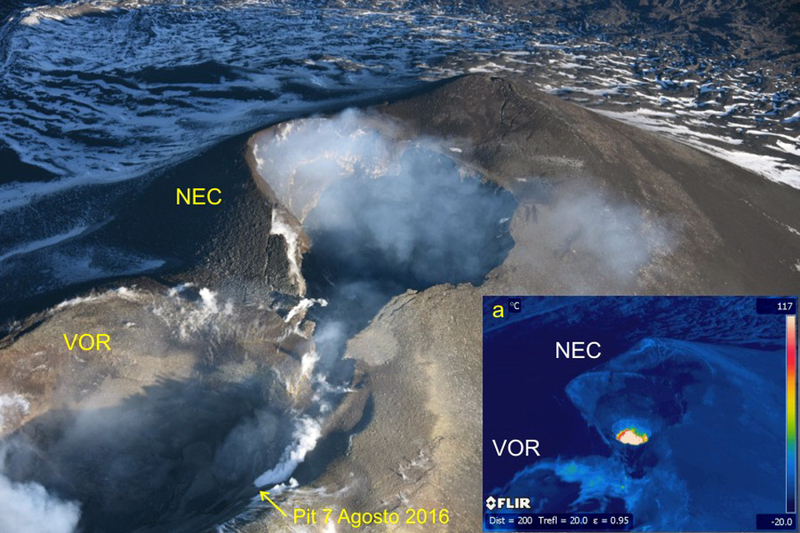 Eruptive activity at Karangetang between June 2014 and March 2016 included intermittent ash plumes, lava flows, pyroclastic flows, and persistent thermal anomalies from a slowly growing lava dome (BGVN 42:02) south of the highest summit (figure 16). Activity since mid-March 2016 has been low, with only a few notable events consisting of a possible ash plume on 10 May 2017, a strong sulfur dioxide emission on 10 October 2017, and a small ash explosion on 2 February 2018. 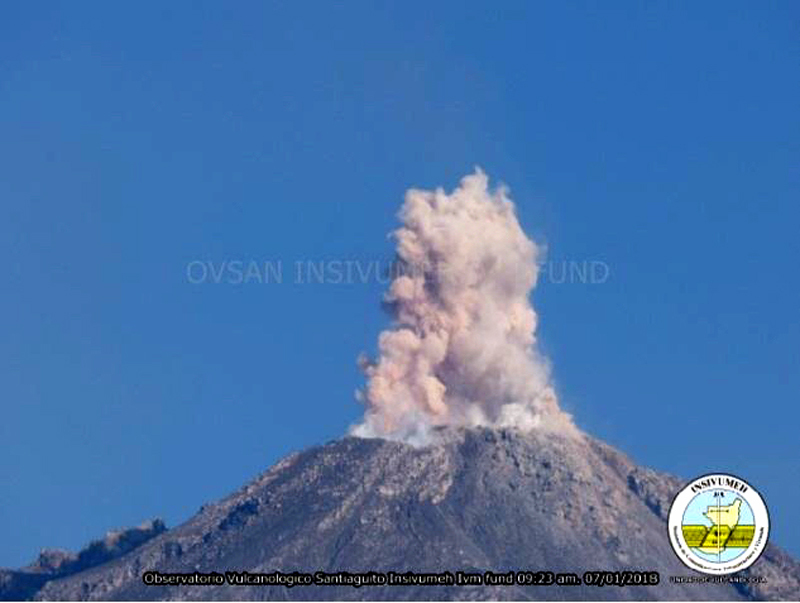 Information was mainly provided by the Pusat Vulkanologi dan Mitigasi Bencana Geologi (PVMBG, also known as Indonesian Center for Volcanology and Geological Hazard Mitigation, CVGHM), the Darwin Volcanic Ash Advisory Centre (VAAC). Figure 16. Satellite image of the summit area of Karangetang on 27 June 2012. The active dome is steaming, with the fumarolic plume curving towards the NE. Dark-colored recent lava flows are noticeable. The higher inactive summit is about 500 m N and 20 m higher than the active dome. Courtesy of DigitalGlobe and Google Earth. Based on analyses of satellite imagery, wind data, and ground-based visual observations, the Darwin VAAC reported that on 10 May 2017 a gas-and-steam plume apparently containing ash rose to an altitude of 3.6 km and drifted over 35 km SE. The Aviation Color Code was briefly raised to Orange. According to a news account (Antara News) that quoted the chief of the volcano's observatory post, "sulfuric smoke" rose 200 m on 10 October 2017. 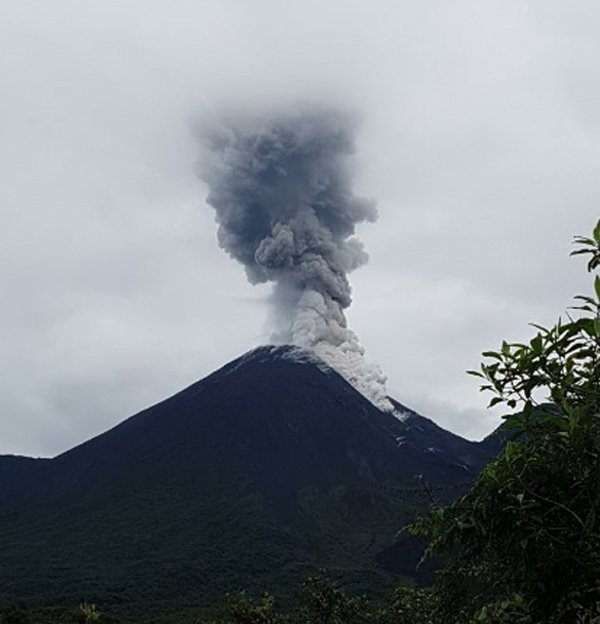 The official stated that this was natural activity for the volcano and also indicated that several types of tremor had occurred the previous day. 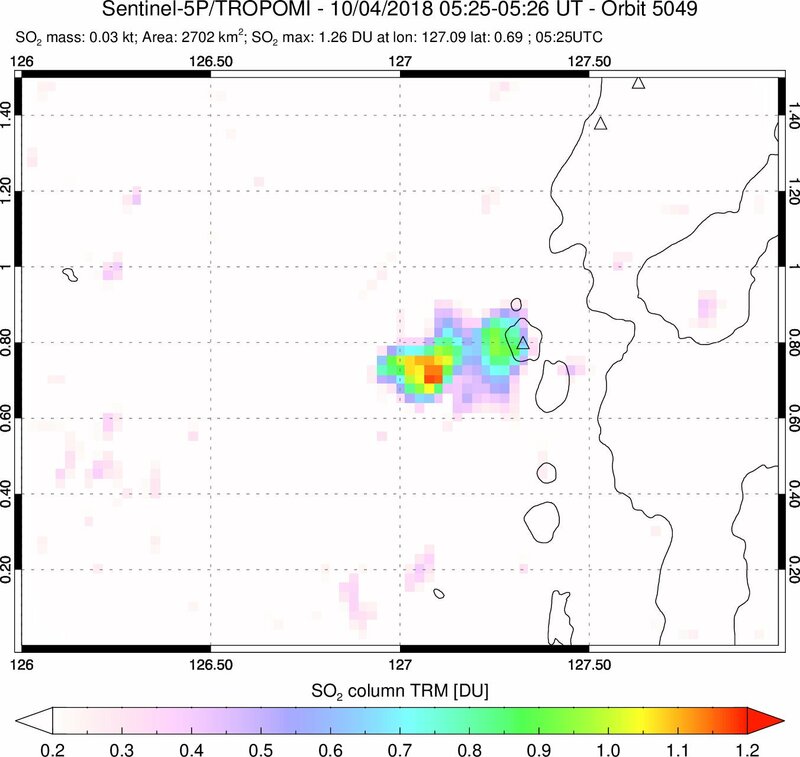 A small SO2 anomaly near the volcano was detected on 11 October 2017, registering 2.1 Dobson Units on the Aura satellite Ozone Monitoring Instrument. 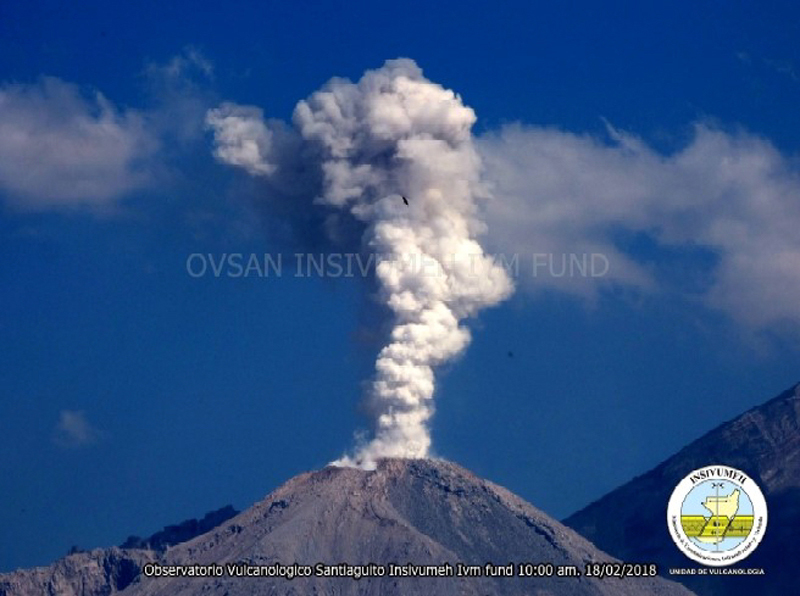 In a Volcano Observatory Notice for Aviation (VONA) issued on 2 February 2018, PVMBG reported an explosion, crater incandescence, and an ash plume that rose 600 m above the summit. The Aviation Color Code was raised from Unassigned to Yellow. No MODVOLC thermal anomalies were detected during the reporting period. 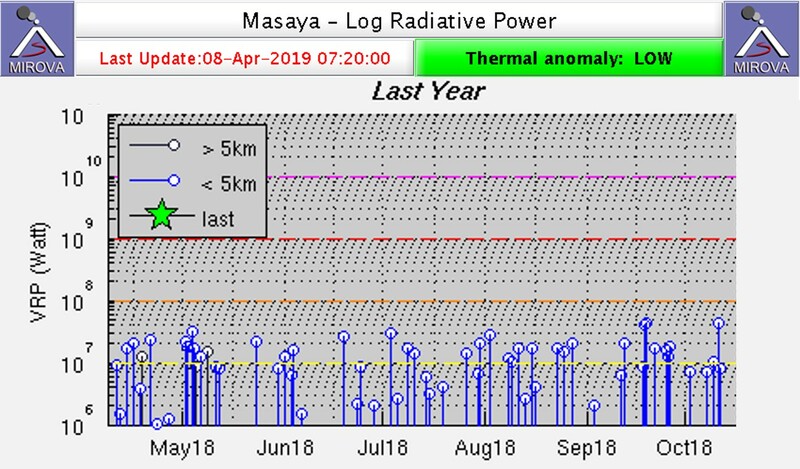 The MIROVA system, however, detected twelve scattered low-power thermal anomalies in the year ending on 26 April 2018. 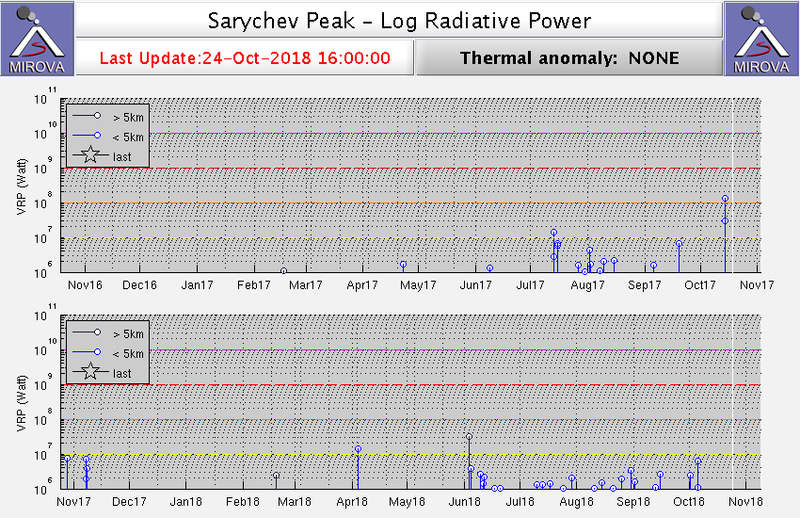 One of the thermal anomalies occurred around 10 October. Information Contacts: Pusat Vulkanologi dan Mitigasi Bencana Geologi (PVMBG, also known as Indonesian Center for Volcanology and Geological Hazard Mitigation, CVGHM), Jalan Diponegoro 57, Bandung 40122, Indonesia (URL: http://www.vsi.esdm.go.id/); Darwin Volcanic Ash Advisory Centre (VAAC), Bureau of Meteorology, Northern Territory Regional Office, PO Box 40050, Casuarina, NT 0811, Australia (URL: http://www.bom.gov.au/info/vaac/); Hawai'i Institute of Geophysics and Planetology (HIGP) - MODVOLC Thermal Alerts System, School of Ocean and Earth Science and Technology (SOEST), Univ. of Hawai'i, 2525 Correa Road, Honolulu, HI 96822, USA (URL: http://modis.higp.hawaii.edu/); MIROVA (Middle InfraRed Observation of Volcanic Activity), a collaborative project between the Universities of Turin and Florence (Italy) supported by the Centre for Volcanic Risk of the Italian Civil Protection Department (URL: http://www.mirovaweb.it/); NASA Goddard Space Flight Center (NASA/GSFC), Global Sulfur Dioxide Monitoring Page, Atmospheric Chemistry and Dynamics Laboratory, 8800 Greenbelt Road, Goddard, Maryland, USA (URL: https://so2.gsfc.nasa.gov/); Antara News (URL: https://en.antaranews.com/). 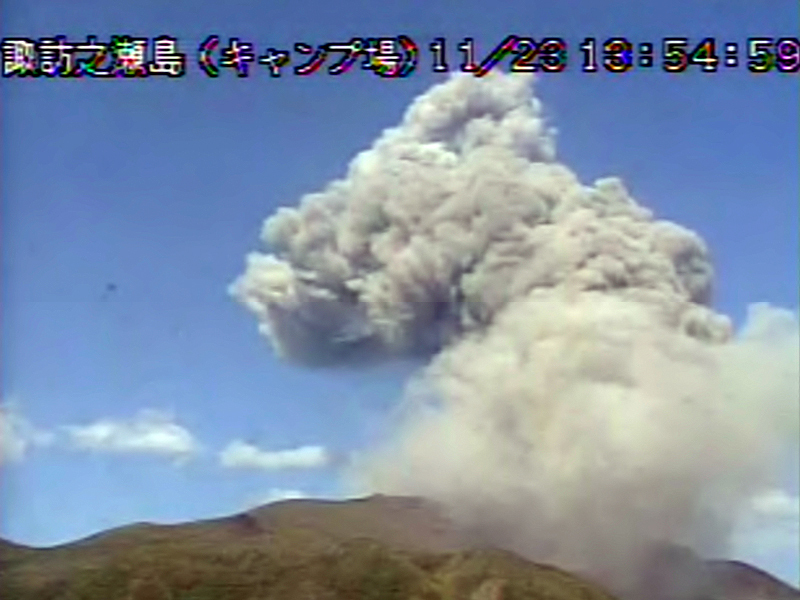 Heightened activity at Kikai (also known as Satsuma Iwojima) was reported during January 2013-July 2014 (BGVN 3907), which included one eruption with intermittent explosions, occasional ash and steam plumes, and sporadic weak seismic tremor. Subsequently, seismicity remained at background levels, and plume activity was low. A short-lived period of heightened activity occurred in March 2018, with increased daily plume heights, sulfur dioxide output, and seismicity. Activity returned to background levels by 26 April. This report is based on information supplied by the Japanese Meteorological Agency (JMA). JMA reported that one small-amplitude short-duration volcanic tremor was detected on 16 March 2018. The number of volcanic earthquakes increased on 19 March, with 93 occurrences, prompting JMA to raise the Alert Level from 1 (active volcano) to 2 (restricted area around the crater), on a 5-level scale. The report noted increased thermal activity since February, with occasional visual observations of incandescence. Plume heights and volcanic earthquakes briefly increased during 22-23 March (figure 8, plot 4). Figure 8. Plots showing multi-year records of measured plume heights (1 and 4) and volcanic earthquakes (2 and 5) during January 1998-April 2018 from Kikai. Explosive events are indicated by the small volcano icons along the top of plot 1. Plot 3 indicates measured sulfur dioxide in tons/day since 2012. The orange diamonds on plot 4 indicate observations of incandescence. Plume heights are measured in meters above the crater. This record is from a seismic station located less than 1 km from the summit. Courtesy of Japan Meteorological Agency (JMA). The number of volcanic earthquakes was low during 27 March-2 April. A white plume at the Iwo-dake summit crater rose to 1,800 m above the crater rim in late March (figure 8, plot 4), the highest seen in many years. At the same crater a highly sensitive surveillance camera revealed incandescence at night on 27 and 28 March due to increased thermal activity. No incandescence was observed after 12 April (figure 8, plot 4). 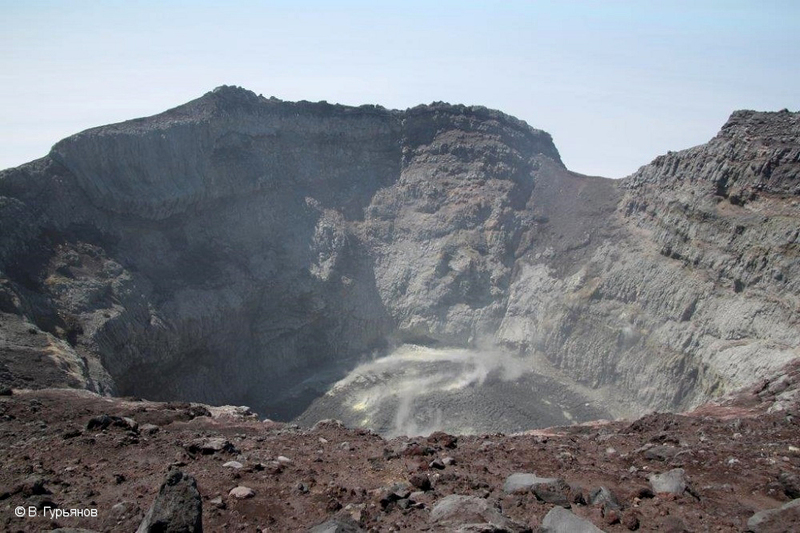 In its report for 20-26 April, JMA noted a white plume at the Iwo-dake summit crater that rose to 700 m above the rim. A field survey conducted on 25 and 26 April confirmed the slight expansion of a thermal anomaly area when compared to 24 and 25 March, but the release amount of sulfur dioxide was slightly less than 300 tons per day (compared with 600 tons on March 24) (figure 8, plot 3). On 27 April 2018, with volcanic earthquakes being small in number and no observed volcanic tremor, JMA determined that activity had decreased and reduced the warning level from 2 to 1. Geologic Background. Kikai is a mostly submerged, 19-km-wide caldera near the northern end of the Ryukyu Islands south of Kyushu. Kikai was the source of one of the world's largest Holocene eruptions about 6300 years ago. Rhyolitic pyroclastic flows traveled across the sea for a total distance of 100 km to southern Kyushu, and ashfall reached the northern Japanese island of Hokkaido. The eruption devastated southern and central Kyushu, which remained uninhabited for several centuries. Post-caldera eruptions formed Iodake lava dome and Inamuradake scoria cone, as well as submarine lava domes. Historical eruptions have occurred in the 20th century at or near Satsuma-Iojima (also known as Tokara-Iojima), a small 3 x 6 km island forming part of the NW caldera rim. Showa-Iojima lava dome (also known as Iojima-Shinto), a small island 2 km east of Tokara-Iojima, was formed during submarine eruptions in 1934 and 1935. 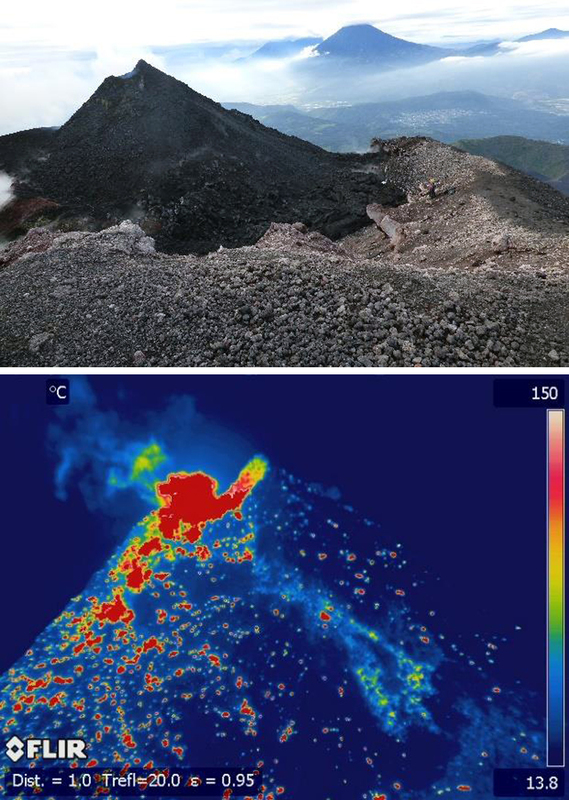 Mild-to-moderate explosive eruptions have occurred during the past few decades from Iodake, a rhyolitic lava dome at the eastern end of Tokara-Iojima. Klyuchevskoy has been active for many decades, alternating between eruptive and less active periods. 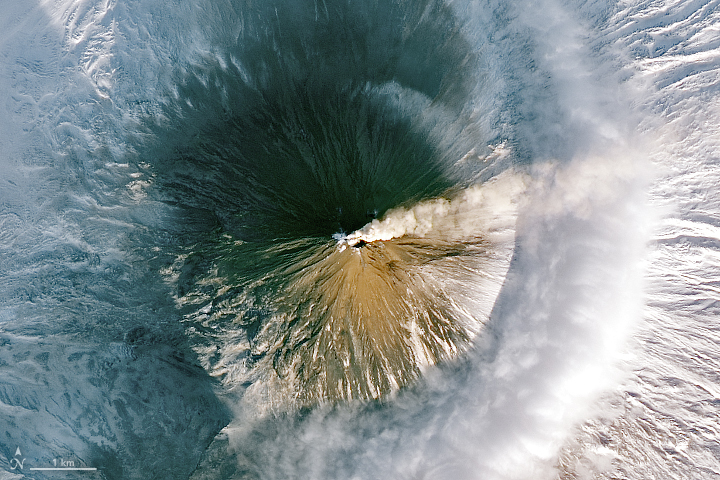 Historical eruptions have originated primarily from the summit crater, but have also included numerous major explosive and effusive eruptions from flank craters. 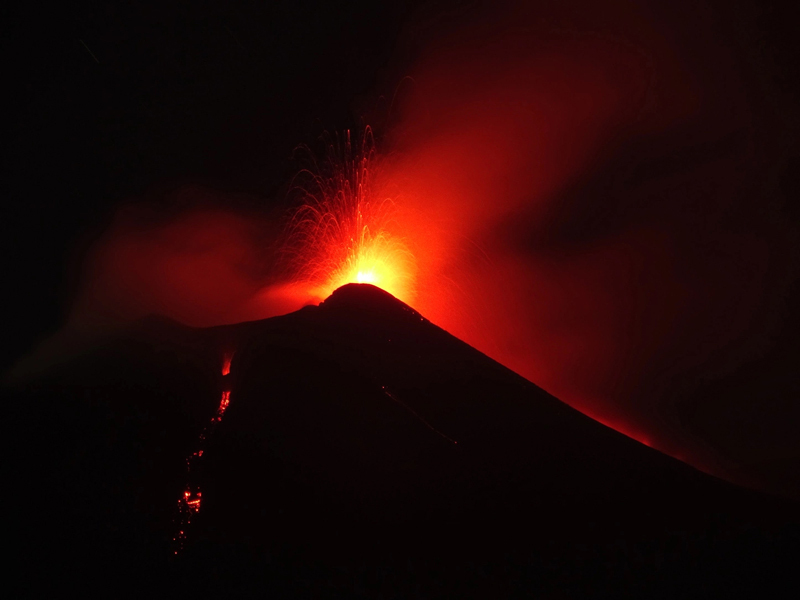 The current eruptive period began in late August 2015. Lava effusion ended in early November 2016 but explosive activity continued to be observed through October 2017 (BGVN 42:11) and into mid-February 2018 as described below. The Kamchatkan Volcanic Eruption Response Team (KVERT) is responsible for monitoring, and is the primary source of information. The Aviation Color Code remained at Orange through April 2018. Strong gas-and-steam activity was observed on 2-5 December 2017. Ash plumes rose to an altitude of 5.5 km and extended for about 180 km (figure 26). Emissions were reported at 2300 on 5 December 2017 with plumes extending 170 km E. Gas-and-steam and ash plumes extended for approximately 95 km to the E and SW on 7 and 13 December, respectively. On 16-19 December the gas-steam and ash plumes extended approximately 140 km E, and on 22-25 December they reached about 220 km E.
Figure 26. Photo of Klyuchevskoy showing a gas-and-steam plume on 3 December 2017. Courtesy of Yu. Demyanchuk (IVS FEB RAS, KVERT). Moderate eruptive activity continued into January and February 2018. On 1, 3, and 4 January gas-and-steam plumes with ash extended approximately 150 km downwind. The plume extended to 160 km N, W, and E on 5, 6, and 8-10 January (figures 27 and 28). On 12 and 17-18 January, the plume extended to 120 km W and E. The Tokyo VAAC reported that on 18 February an ash plume rose to an altitude of 5.2 km and extended SW. No further reports of ash plumes were reported through April 2018. Figure 27. Gas-and-steam plume with minor ash content rising from Klyuchevskoy on 6 January 2018. Courtesy of Yu. Demyanchuk (IVS FEB RAS, KVERT). Figure 28. Close-up satellite image of a small plume of gas, steam, and ash rising from Klyuchevskoy on 10 January 2018 taken by the Operational Land Imager (OLI) on Landsat 8. Courtesy of NASA Earth Observatory, with imagery by Joshua Stevens and Jeff Schmaltz, using Landsat data from the U.S. Geological Survey. 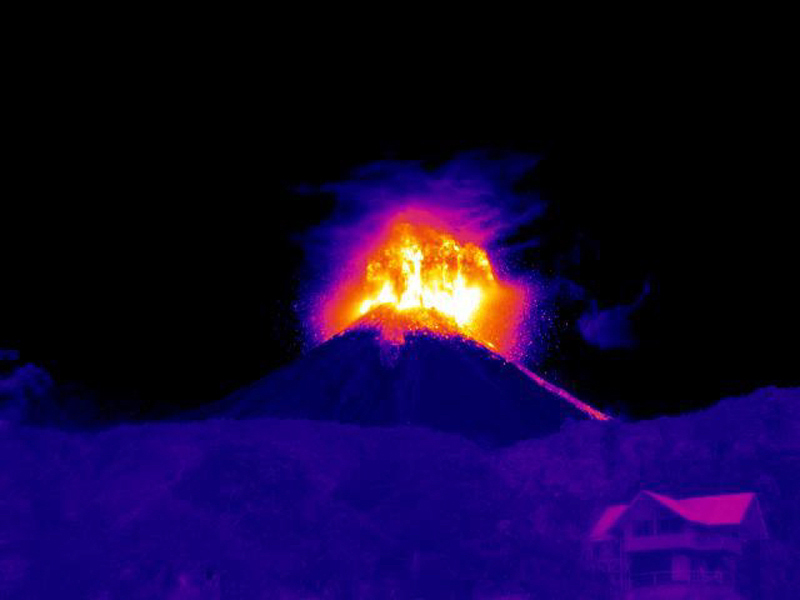 A weak thermal anomaly was detected over the volcano on 5, 6, 11, 16, and 22, December 2017; and on 3, 6, 8, 11, 12, 15 and 17 January 2018. The number of MIROVA thermal anomalies detected also increased in the first half of January 2018; most were low to slightly moderate in intensity. Information Contacts: Kamchatka Volcanic Eruptions Response Team (KVERT), Far Eastern Branch, Russian Academy of Sciences, 9 Piip Blvd., Petropavlovsk-Kamchatsky, 683006, Russia (URL: http://www.kscnet.ru/ivs/kvert/); Institute of Volcanology and Seismology, Far Eastern Branch, Russian Academy of Sciences (IVS FEB RAS), 9 Piip Blvd., Petropavlovsk-Kamchatsky 683006, Russia (URL: http://www.kscnet.ru/ivs/eng/); MIROVA (Middle InfraRed Observation of Volcanic Activity), a collaborative project between the Universities of Turin and Florence (Italy) supported by the Centre for Volcanic Risk of the Italian Civil Protection Department (URL: http://www.mirovaweb.it/); NASA Earth Observatory, EOS Project Science Office, NASA Goddard Space Flight Center, Goddard, Maryland, USA (URL: http://earthobservatory.nasa.gov/); Tokyo Volcanic Ash Advisory Center (VAAC), 1-3-4 Otemachi, Chiyoda-ku, Tokyo, Japan (URL: http://ds.data.jma.go.jp/svd/vaac/data/). Extensive lava flows, bomb-laden Strombolian explosions, and ash plumes emerging from MacKenney crater have characterized persistent activity at Pacaya since 1961. 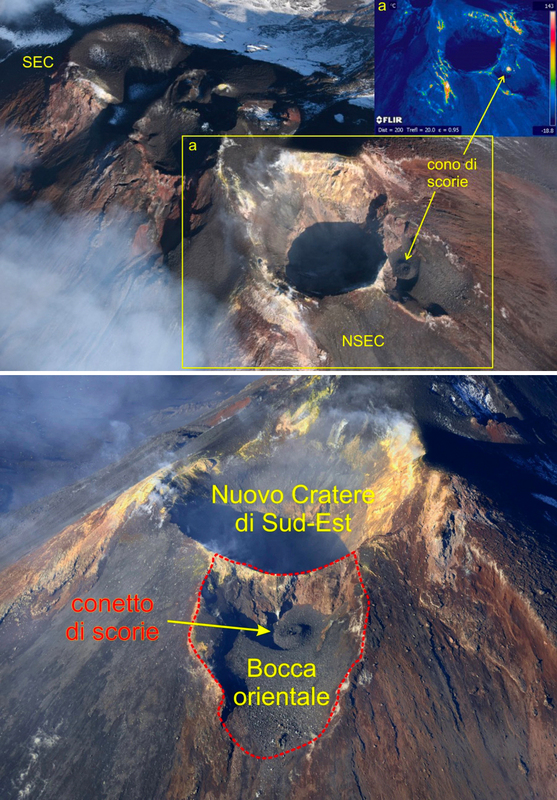 The latest eruptive episode began with intermittent ash plumes and incandescence in June 2015; the growth of a new pyroclastic cone inside the summit crater was confirmed in mid-December 2015. Strombolian activity from the cone continued during 2016 and it grew sporadically through September 2017 (BGVN 42:12). Lava flows first emerged from fissures around the summit during January-April 2017. Explosions from the cone summit caused growth and destruction of the top of the cone; by the end of September it was about 10 m above the elevation of the crater rim. 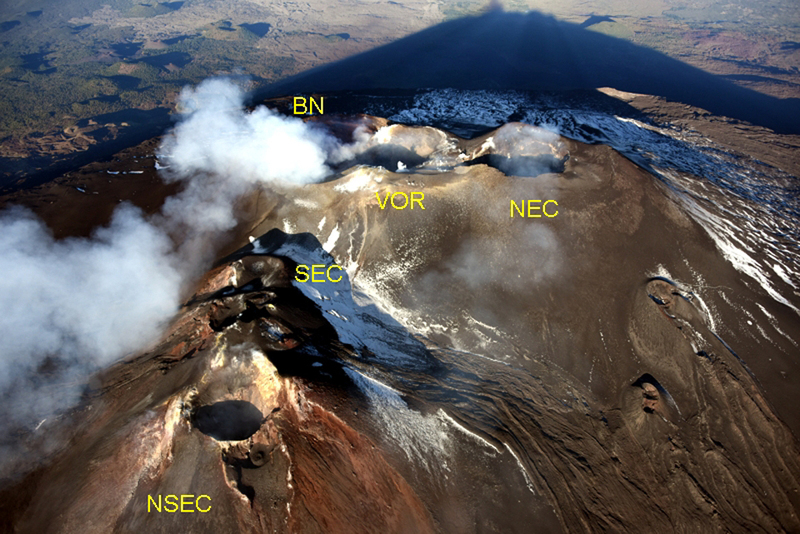 This report describes the continued growth of the pyroclastic cone and the increasing emergence of lava flows around the summit during October 2017-March 2018. Information was provided primarily by the Instituto Nacional de Sismologia, Vulcanologia, Meteorologia e Hydrologia (INSIVUMEH) and satellite thermal data. 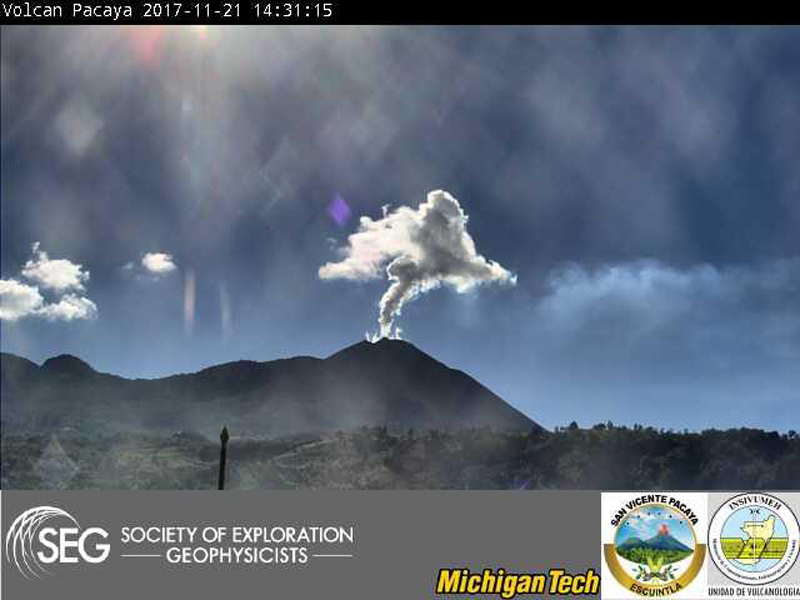 Thermal activity was relatively quiet at Pacaya during October and November 2017. The pyroclastic cone inside MacKenney crater continued to grow as material from Strombolian explosions sent ejecta a few tens of meters above the cone and onto its flanks, slowly filling the area within the crater. In late November, small lava flows began to emerge from the crater. Material flowed from the 2010 fissure on the NW side of the crater, and also appeared from new lateral fissures on the W and SW flanks. Multiple small short-lived lava flows traveled a few hundred meters down the flanks with increasing frequency during January through March 2018. Strombolian activity from the summit of the cone occasionally reached over 100 m; by the end of March, the summit of the cone remained about 25 m above the crater rim, and much of the crater was filled with ejecta (figure 84). Figure 84. 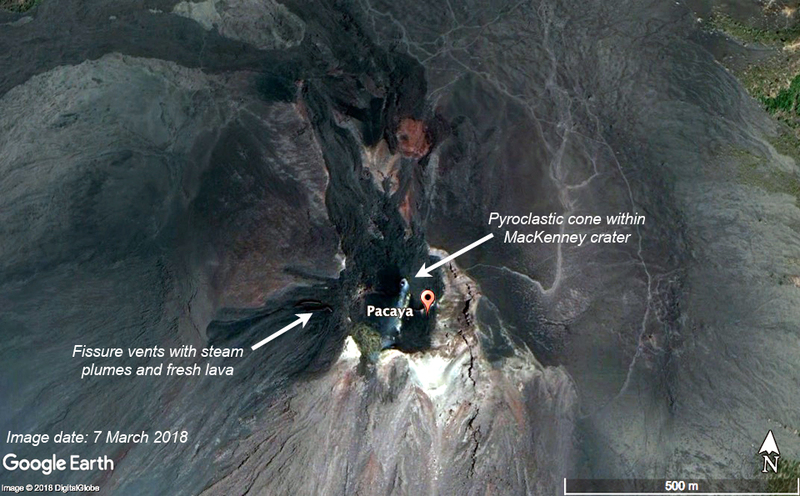 A satellite image of Pacaya dated 7 March 2018 shows MacKenney crater at the summit nearly full of ejecta from the growing pyroclastic cone, and at least two small steam plumes on the SW flank from fissures that show dark traces of recent fresh lava. Courtesy of DigitalGlobe and Google Earth. Activity during October-December 2017. Activity during October 2017 consisted primarily of degassing with small plumes of steam and gas rising 100 m above the summit, and weak Strombolian explosions. . By the end of the month, the cone inside MacKenney crater rose about 10 m above the crater rim. 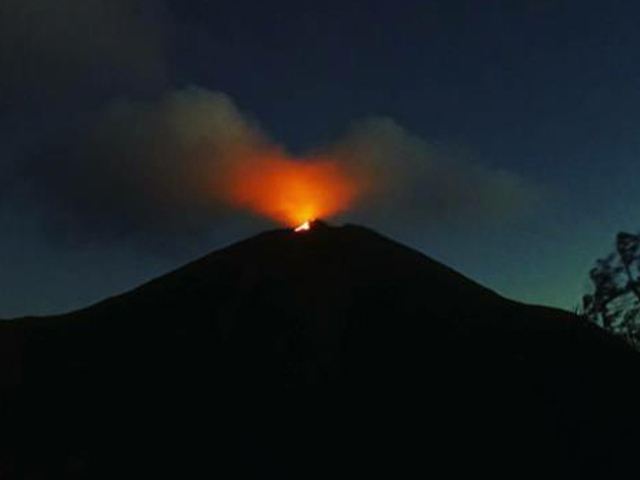 At night, incandescent ejecta could be seen 25-100 m above the summit of the cone. During the last week of October strong winds dispersed the plumes SW and SE, and ashfall was reported 2 km from the crater in El Rodeo. Steam and gas plumes generally rose no more than 25 m above the summit for the first 20 days of November 2017. 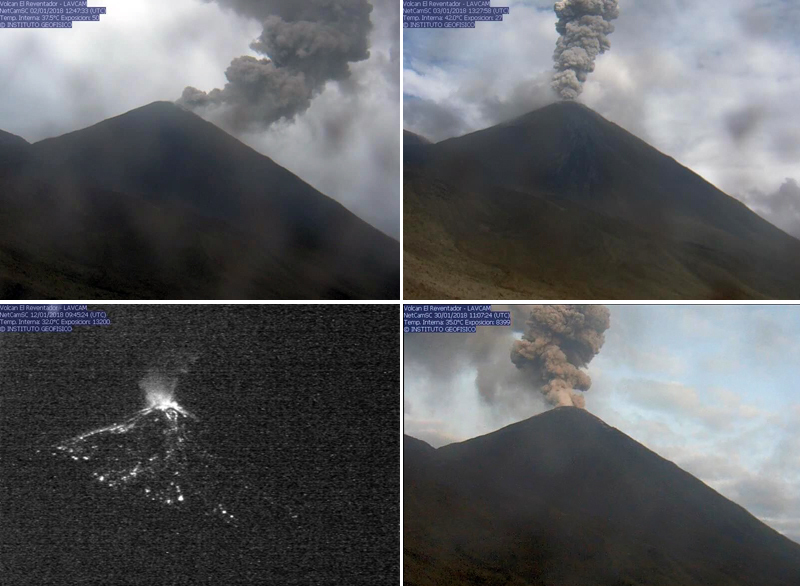 Beginning on 21 November, more substantial steam and gas plumes, rising 500 m, were observed in the webcam (figure 85). An increase in tremor activity on 28 November coincided with an increase in explosive activity, a gray ash plume, and the appearance of a small lava flow on the NW flank that extended about 30 m. By the end of the month the cone had reached about 25 m above the rim of MacKenney crater and continued to grow from the accumulation of tephra fragments ranging in size from one millimeter to 50 cm that were ejected 25-100 m above the summit (figure 86). Explosions could be heard up to 1 km from the cone. Figure 85. 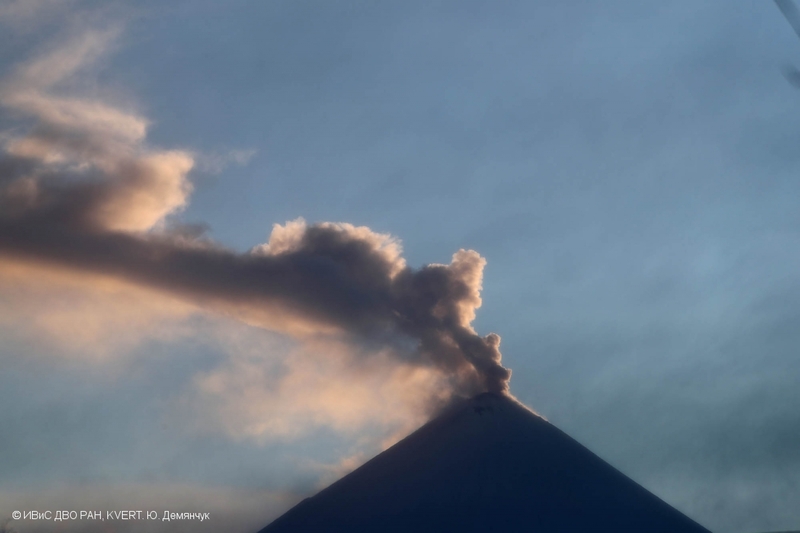 A steam plumes rises about 500 m above the summit of Pacaya on 21 November 2017. Courtesy of Michigan Technological University and INSIVUMEH (Departamento de Investigación y servicios Geofísicos, Informe mensual de la actividad volcánica, novembre 2017). Figure 86. 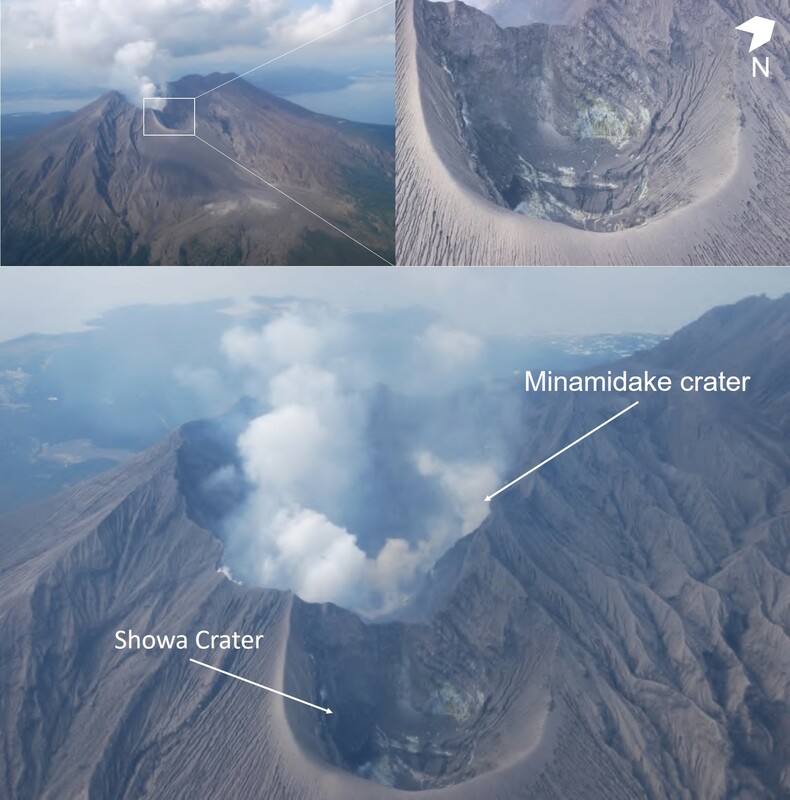 The pyroclastic cone at Pacaya had nearly filled MacKenney Crater by 17 November 2017 (upper photo). 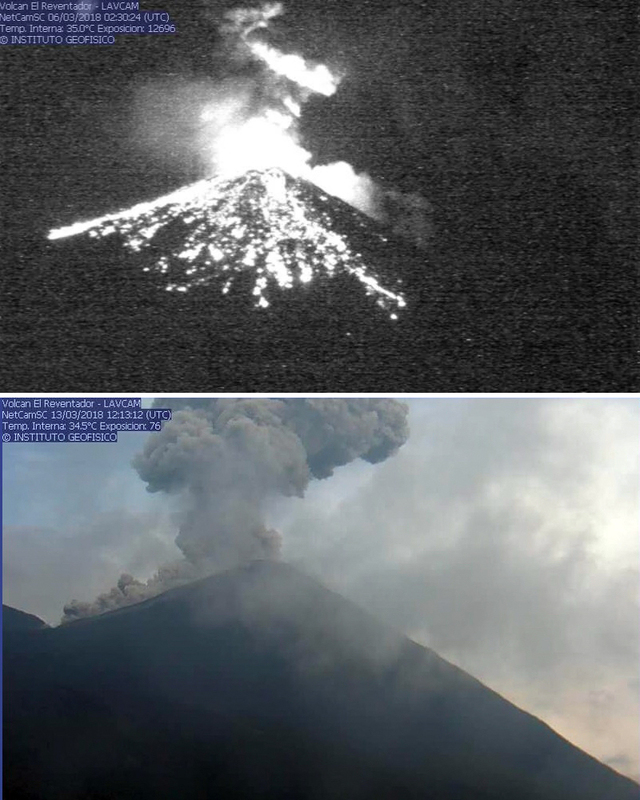 An explosion from the summit of the cone with ash and ejecta was captured by the thermal camera on 17 November (lower image). Courtesy of INSIVUMEH (Departamento de Investigación y servicios Geofísicos, Informe mensual de la actividad volcánica, novembre 2017). Strombolian explosions rising to 25 m continued in early December. 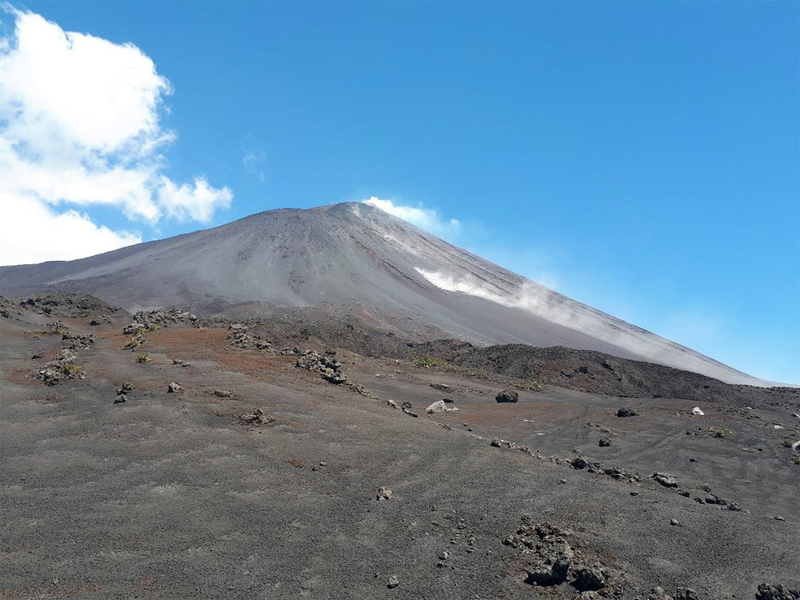 On 10 December 2017, INSIVUMEH noted that there were two lava flows, one flowing on the SE flank with a length of 50-75 m and a second flowing NW towards Cerro Chino for 75-100 m. Strombolian explosions were reported 100 m above the summit of the cone on 15 December, and 25-50 m high on 25 December. The flow on the NW flank was about 100 m long on 26 December. Activity during January-March 2018. Weak Strombolian activity continued from the cone during January 2018 with ejecta reaching 50 m above the summit. Small lava flows on the NW flank, generally only a few tens of meters long, were visible as incandescence at night (figure 87). While the height of the cone inside MacKenney crater remained about 25 m above the crater rim, material from the continuing low-level explosions had filled a large area of the crater by the end of the month. 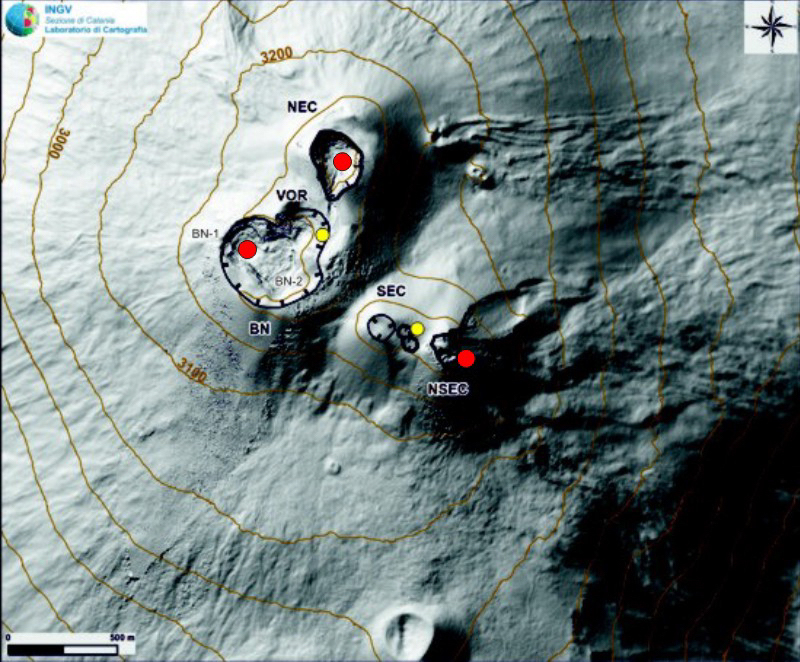 Blocks up to 1 m in diameter were also dislodged by the tremors and flow activity on the SW flank of MacKenney crater (figure 88). An increase in explosive activity beginning on 20 January resulted in audible explosions heard 2 km from the cone and fine ash deposited on the flanks. A new, larger flow also emerged from the crater early on 20 January and descended about 400 m down the SW flank, with material spalling off the front as it cooled. 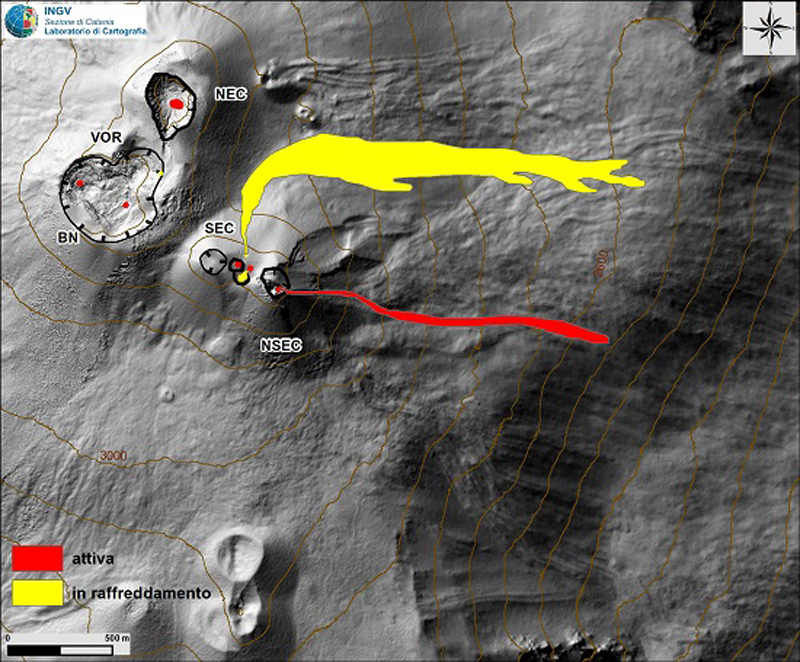 The following day, low-level Strombolian activity continued, and the flow remained active 200 m down the SW flank. During the last few days of January, the flow rate decreased, and the active flow was only 25 m long (figure 89). Figure 87. 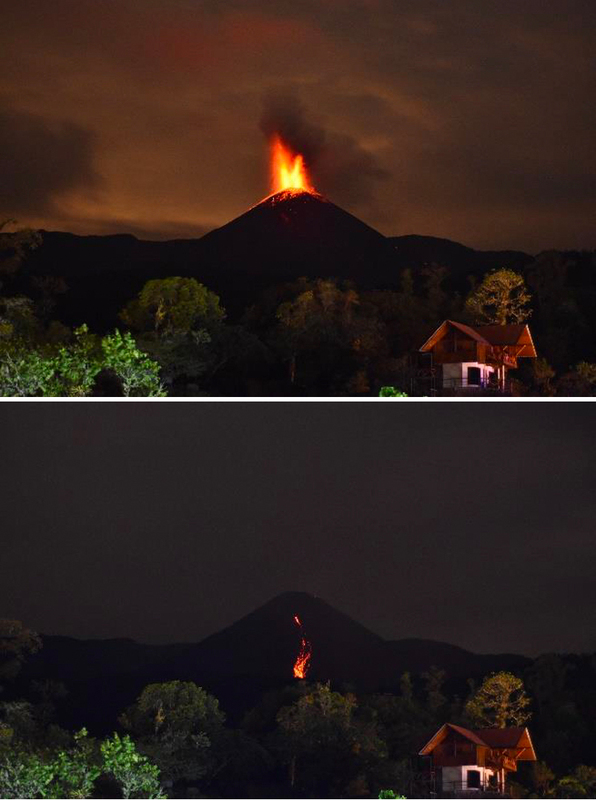 Incandescence from the summit of Pacaya on 8 January 2018, viewed from the SW flank, was caused by Strombolian activity and lava flows. Photo by Instagram user @cesiasocoy, courtesy of INSIVUMEH (Departamento de Investigación y servicios Geofísicos, Informe mensual de la actividad volcánica, enero 2018). Figure 88. Low-level Strombolian activity sent ejecta up to 50 m above the summit of the cone at MacKenney crater on Pacaya during most of January 2018. The top of the cone inside the crater was just visible above the crater rim at the summit in this view from the NW flank taken on 17 January 2018. White blocks at the base of the SW slope on the right of the image are recently dislodged, 1-m-diameter blocks. Courtesy of INSIVUMEH (Departamento de Investigación y servicios Geofísicos, Informe mensual de la actividad volcánica, enero 2018). Figure 89. 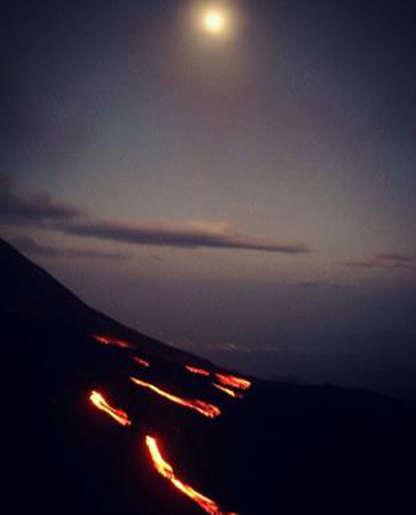 Lava flows on the SW flank of Pacaya on 25 January 2018, photographed by Instagram user @Carolinegod1. Courtesy of INSIVUMEH (Departamento de Investigación y servicios Geofísicos, Informe mensual de la actividad volcánica, enero 2018). Low-level steam and occasional gas plumes rising up to 300 m above the summit were typical during February 2018 (figure 90). In addition, intermittent lava flows continued to travel tens to a few hundred meters down the S, SW, and W flanks. A 25-m-long flow was observed on the SW flank on 2 February. On 8 February, a 150-m-long flow was noted, also on the SW flank. 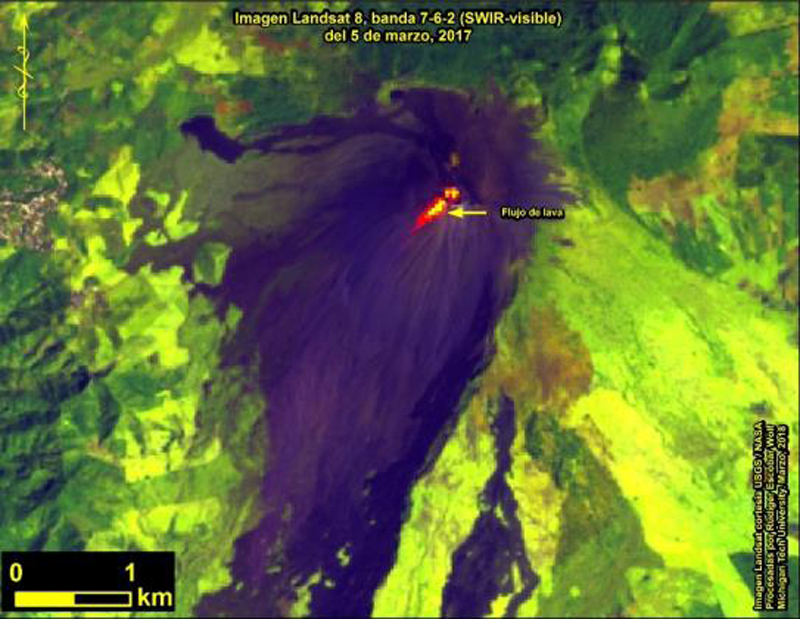 INSIVUMEH reported a 300-m-long lava flow from the NW area of crater on 9 February in the region of the 2010 fissure; it traveled NW towards Cerro Chino crater. A flow 75-100 m long was observed on the SW flank on 10 February; the next day 150-m-long flows were visible on both the SW and W flanks. Flows on both flanks were 100 m long on 12 February. A 30-m-long flow appeared on the SW flank on 13 February. The flow on the NW flank that began on 9 February was 20-m-wide and only 50 m long during the afternoon of 14 February. A flow was also visible on 14 February extending 250 m down the SW flank (figure 91). Figure 90. A vigorous steam plume rose 300 m from the summit of the pyroclastic cone inside MacKenney crater at Pacaya during February 2018. 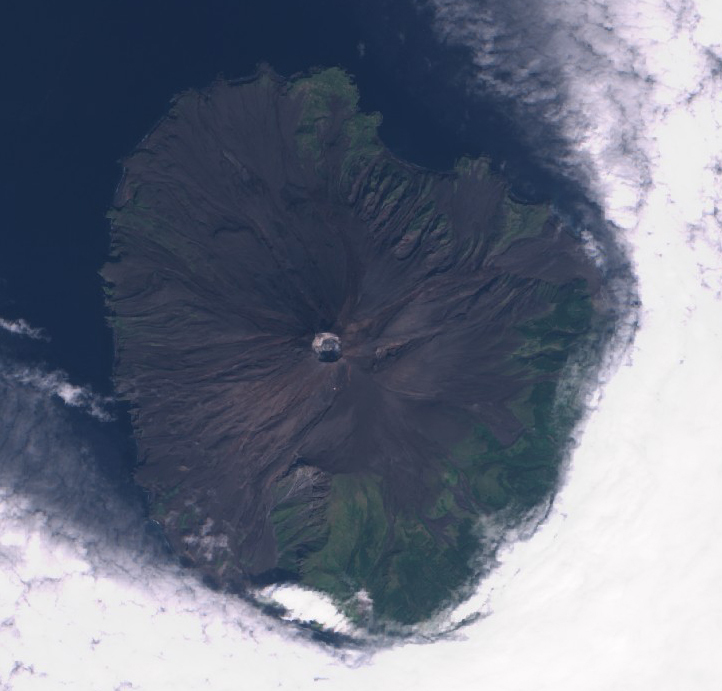 The top of the cone was just visible above the crater rim in this view from the NW. Courtesy of INSIVUMEH (Departamento de Investigación y servicios Geofísicos, Informe mensual de la actividad volcánica, febrero 2018). Figure 91. Steaming lava flowed on the SW flank of Pacaya on 14 February 2018 and dislodged loose debris on the slope. Courtesy of INSIVUMEH (Departamento de Investigación y servicios Geofísicos, Informe mensual de la actividad volcánica, febrero 2018). Multiple lava flows on the SW flank ranged from 50-200 m long during 15-20 February. A flow on the W flank grew from 25 to 150 m during 17-23 February (figure 92). A flow reached 500 m down the SW flank on 25 February and after flow-front collapses was still 300 m long by the end of the month. A new surge of lava on 27 February emerged from the fissure on the NW flank of MacKenney crater and traveled 150 m towards Cerro Chino crater. Explosive activity remained constant; weak explosions, generally 3-5 times per hour, scattered ejecta on the flanks of the cone and created incandescence at night that often reached 15-35 m above the cone. The explosions also generated weak avalanches that sent material up to 1 m in diameter down the S and SW flanks to an area frequented by park visitors. Explosions were sometimes heard up to 3 km from the crater. Strombolian explosions increased in height towards the end of the month; they were reported at 150 m above the summit on 26 February. Figure 92. 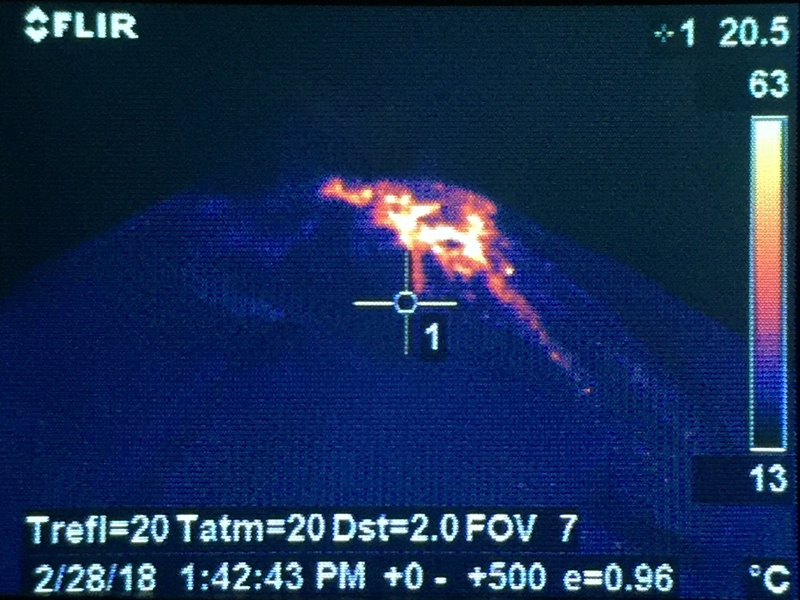 A lava flow emerged from a fissure on the W flank of Pacaya on 18 February 2018 and was imaged with a thermal camera as it traveled 150 m down the flank. Courtesy of INSIVUMEH (Departamento de Investigación y servicios Geofísicos, Informe mensual de la actividad volcánica, febrero 2018). 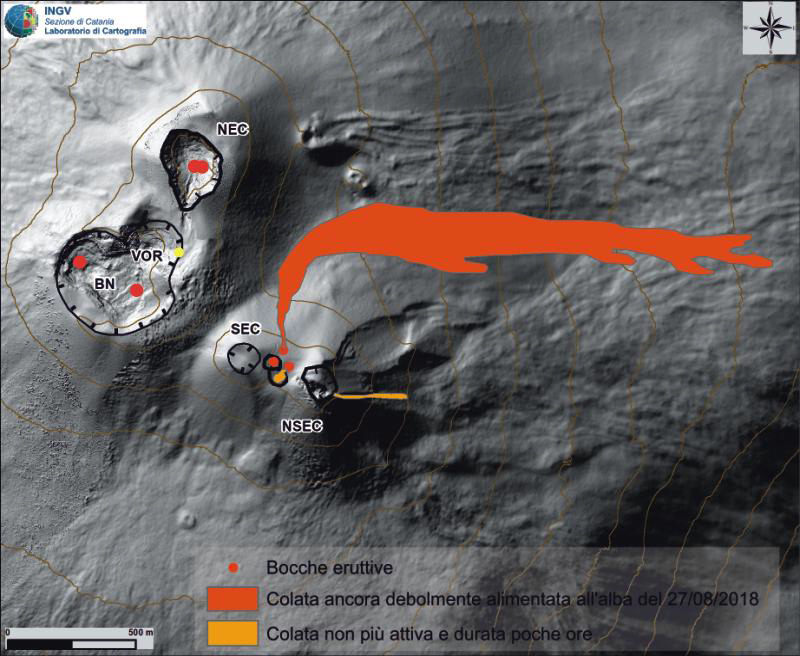 Strombolian activity and persistent lava flows throughout March 2018 resulted in continued growth of the pyroclastic cone within the MacKenney crater. Low-level steam and gas plumes generally rose a few tens of meters above the summit; occasional plumes rose as high as 500 m. Small lateral fissures near the crater rim produced repeated small lava flows that generally flowed less than 250 m SW and W. Weak explosions averaging 3-5 per hour sent ejecta 10-50 m above the pyroclastic cone. During the first week of March, flows on the SW flank were active as far as 500 m down the flank. A flow on 4 March was 65 m long, and one on 5 March ranged from 50-200 m long (figure 93). During the second week, two flows were active to 300 m down the W flank, and two others on the SW flank were 150-200 m long. A flow was reported 200 m down the E flank on 16 March. Multiple lava flows were visible during 17-23 March; one traveled 250 m down the SW flank, two others went 150 m down the W flank and remained active through the end of the month. Figure 93. 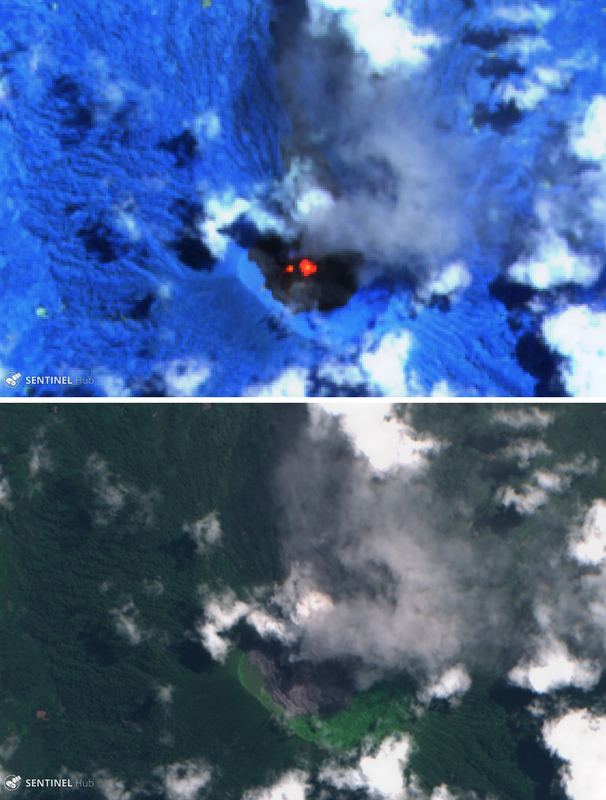 Landsat satellite imagery from 5 March 2018 shows a thermal anomaly from a SW-directed lava flow at Pacaya, about 250 m long. Landsat 8 image processed by Rudiger Escobar (Michigan Technological University), courtesy of INSIVUMEH (Departamento de Investigación y servicios Geofísicos, Informe mensual de la actividad volcánica, marzo 2018). Information Contacts: Instituto Nacional de Sismologia, Vulcanologia, Meteorologia e Hydrologia (INSIVUMEH), Unit of Volcanology, Geologic Department of Investigation and Services, 7a Av. 14-57, Zona 13, Guatemala City, Guatemala (URL: http://www.insivumeh.gob.gt/); Google Earth (URL: https://www.google.com/earth/). 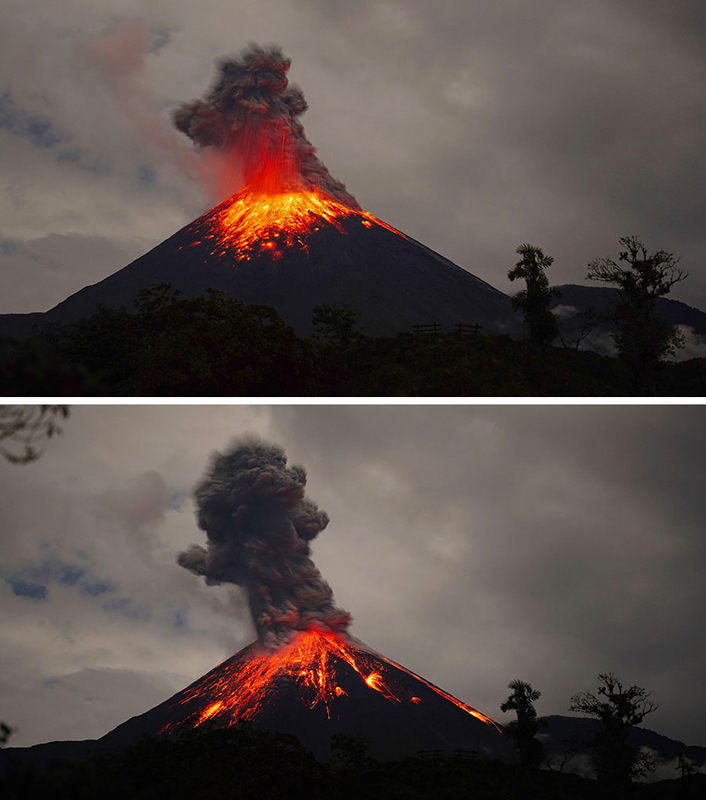 Historical records of eruptions at Ecuador's Volcán El Reventador date back to 1541 and include numerous lava flows and explosive events (figure 74). The largest historical eruption took place in November 2002 and generated a 17-km-high eruption cloud, pyroclastic flows that traveled 8 km, and several lava flows. 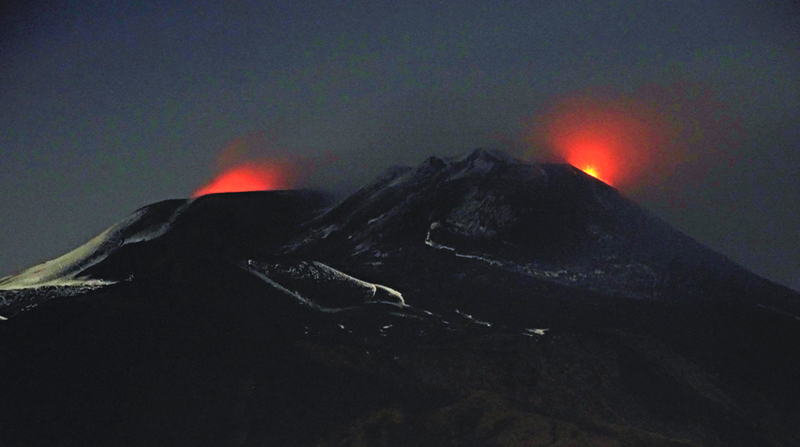 Eruptive activity has been continuous since 2008. 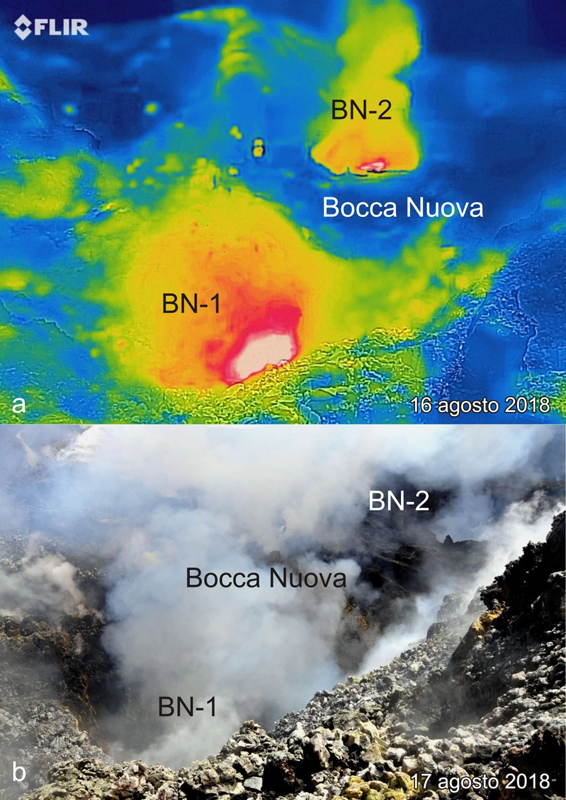 Persistent ash emissions and incandescent block avalanches characterized activity during January-September 2017 with large pyroclastic and lava flows during June and August (BGVN 43:01). Explosions that produced ash plumes and incandescent blocks continued throughout October 2017-March 2018. Information is provided primarily by the Instituto Geofisico-Escuela Politecnicia Nacional (IG-EPN) of Ecuador, the Washington Volcanic Ash Advisory Center (VAAC), and also from satellite-based MODIS infrared data. Figure 74. 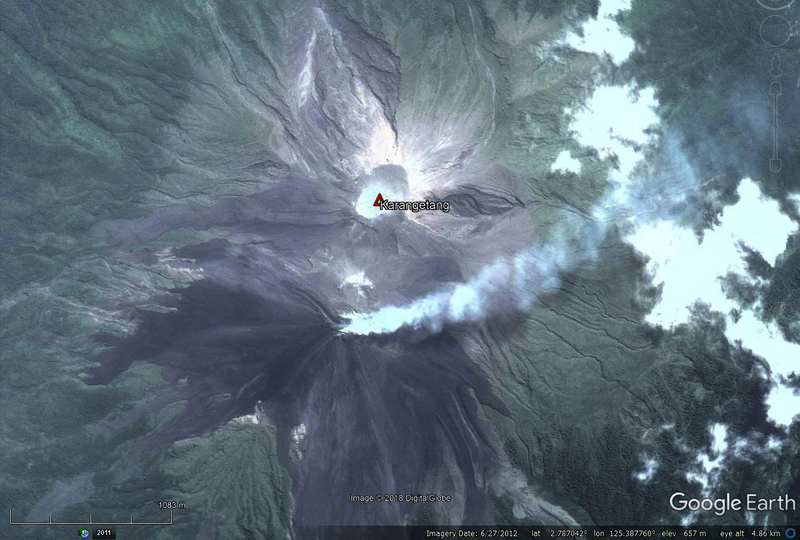 Aerial image of Reventador's inner caldera with its pyroclastic cone emitting a plume of steam and ash. View is looking to the W. Photograph taken during 1-7 December 2017, copyright by Martin Rietze and used with permission. Persistent, near-daily ash emissions were typical for Reventador during October 2017-March 2018 (figure 75). In general, the plumes drifted W and NW over sparsely populated nearby areas, but occasional wind-direction changes resulted in ashfall in larger communities within 30 km to the S and SW. The plume heights were commonly 1,000 m above the summit, with the highest plume rising 5 km (to 8.5 km altitude) in October. Most days that the summit and slopes were not obscured by weather clouds, there were observations of incandescent blocks falling at least 300-500 m down the flanks. 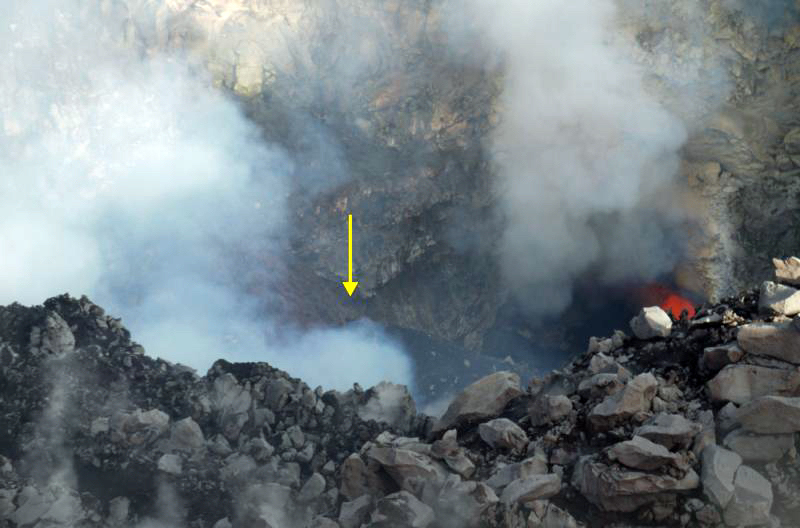 Larger explosions generated Strombolian fountains and incandescent blocks that traveled 800 m down the flanks every week, even farther on occasion (figure 76). Heavy rains caused one lahar in late November; no damage was reported. Small pyroclastic flows on the flanks were observed once or twice each month (figure 77). The lava flows of June and August 2017 continued to cool on the flanks (figure 78). Thermal activity was somewhat higher during October 2017 with 19 MODVOLC thermal alerts issued, but it remained constant throughout the rest of the period with 8-11 alerts each month. 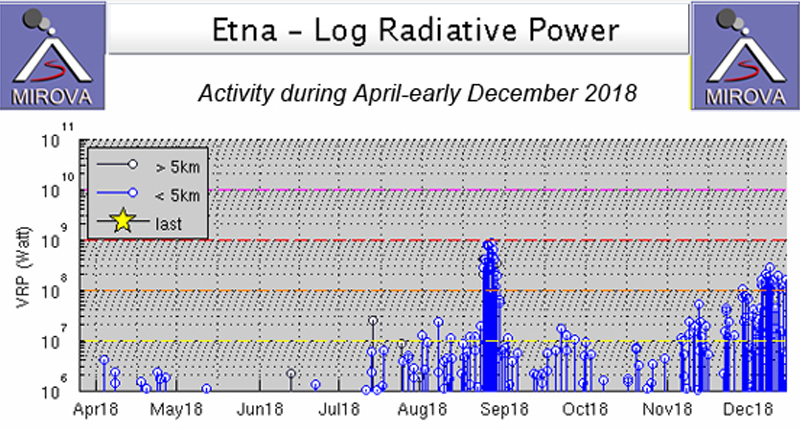 The MIROVA radiative power data showed a similar pattern of moderate, ongoing activity during this time. Figure 75. A dense ash plume rose from Reventador during the first week of December 2017, viewed from a shelter 3.5 km E of the summit. Photograph taken during 1-7 December 2017, copyright by Martin Rietze and used with permission. Figure 76. Incandescent blocks rolled hundreds of meters down the flanks of Reventador during the first week of December 2017. Photograph taken during 1-7 December 2017, copyright by Martin Rietze and used with permission. Figure 77. 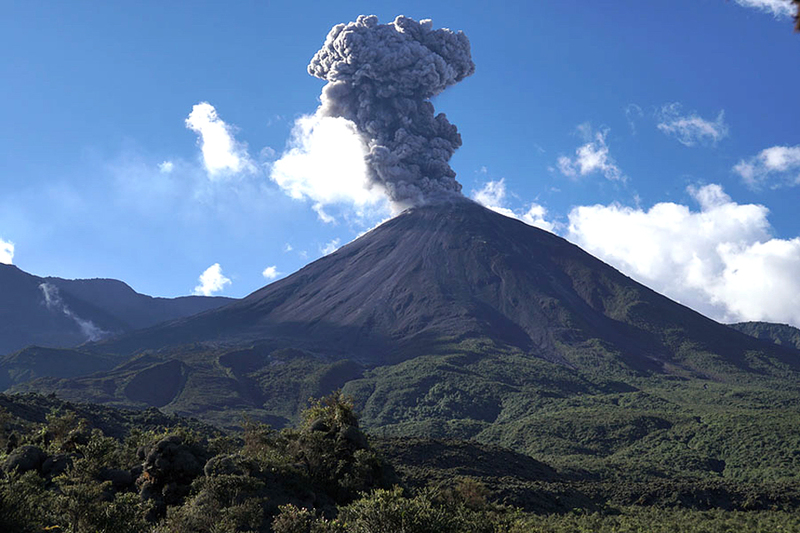 A small pyroclastic flow traveled down the flank of Reventador during the first week of December 2017 while an ash plume rose about 1 km above the summit. Photograph taken during 1-7 December 2017, copyright by Martin Rietze and used with permission. Figure 78. The lava flows from June and August 2017 were still cooling on the flanks of Reventador during the first week of December 2017. Photograph taken during 1-7 December 2017, copyright by Martin Rietze and used with permission. Activity during October-December 2017. The Washington VAAC issued ash advisories every day but one during October 2017. IGEPN reported near-daily emissions of ash, with plumes rising over 1,000 m many days of the month and rising to 500-800 m the other days. Plume drift directions were generally W or NW. 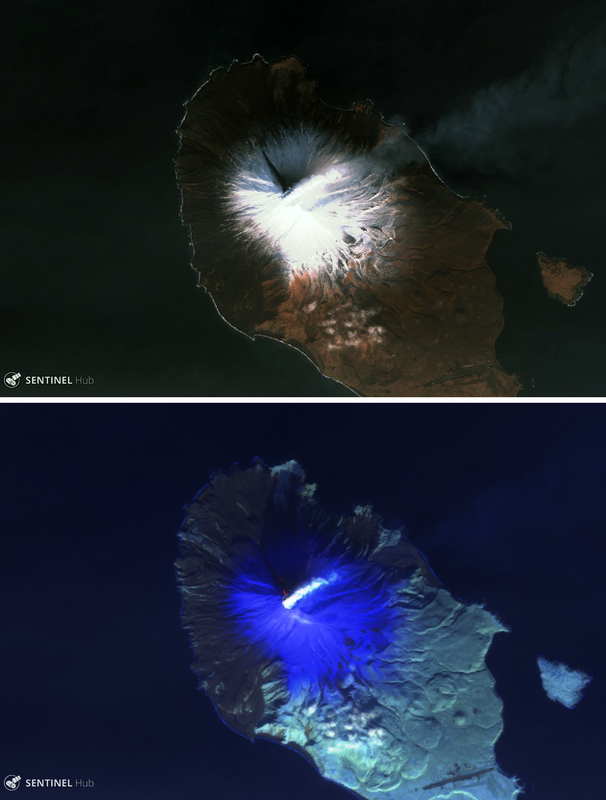 Incandescence at the summit crater was visible on most nights, and incandescent block avalanches were seen rolling 400-800 m down the flanks during 15 nights of the month. Explosive activity intensified for several days near the end of the month (figure 79). 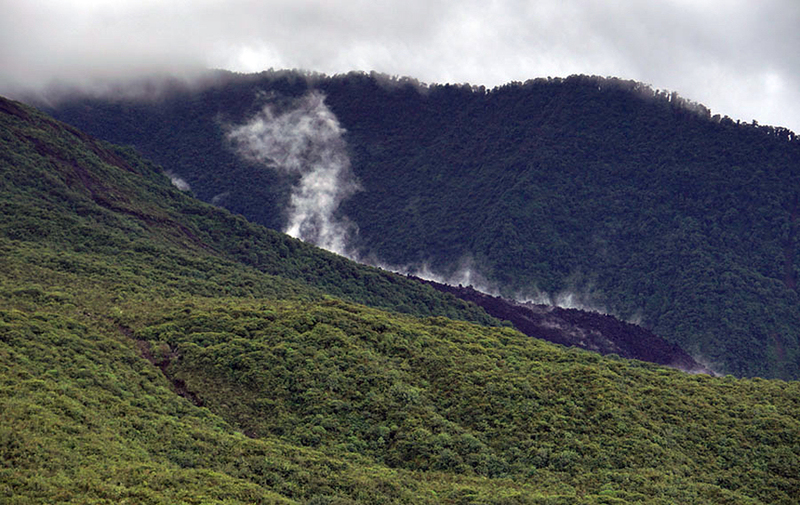 A possible pyroclastic flow traveled down the SE flank in the morning of 24 October. Figure 79. 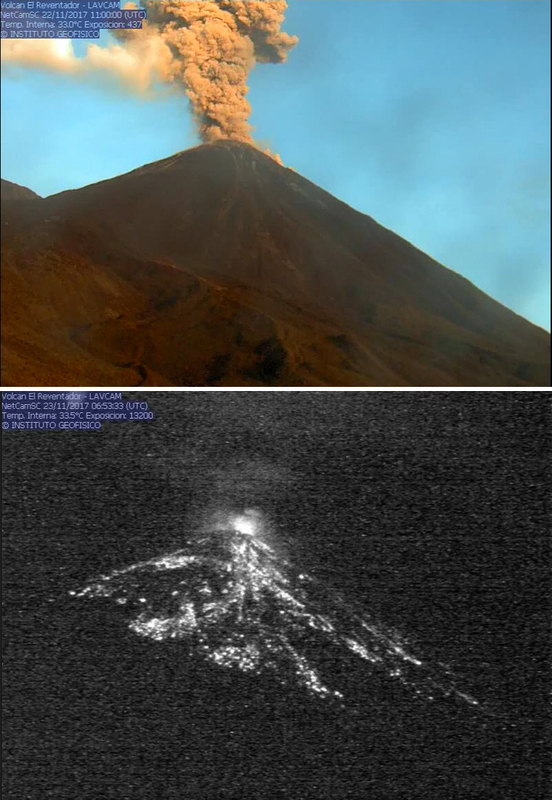 Strombolian explosions from two vents at the summit and incandescence on the SE flank of Reventador were captured on 24 October 2017 by B. Bernard. Photo taken from the Hosteria Reventador, 7.2 km SE from the summit. Courtesy of IGEPN (Informe Especial del Volcán El Reventador – 2017 – No. 5, Actualización de la actividad del volcán, 30 de octubre del 2017). 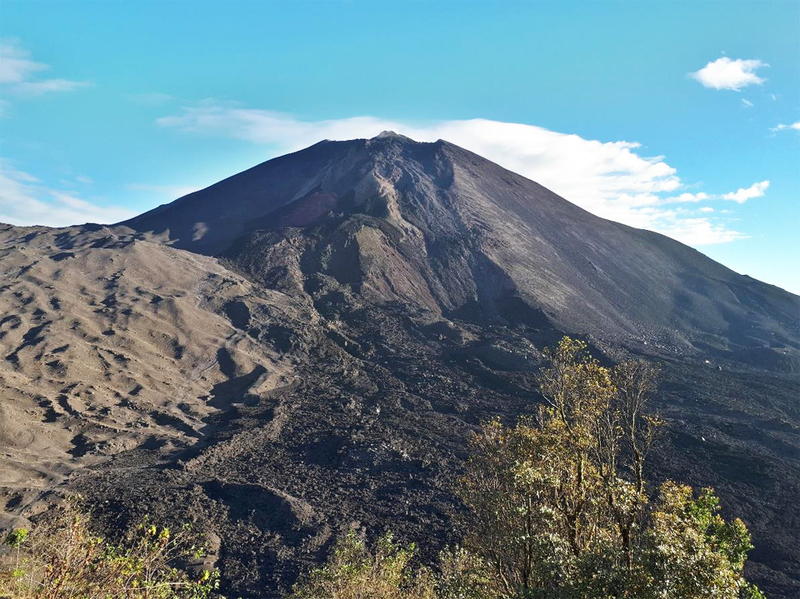 IGEPN scientists in the field during 23-25 October 2017 noted a high level of explosive activity with loud noises and vibrations felt in the vicinity of Hostería Reventador, about 7.2 km SE of the volcano. 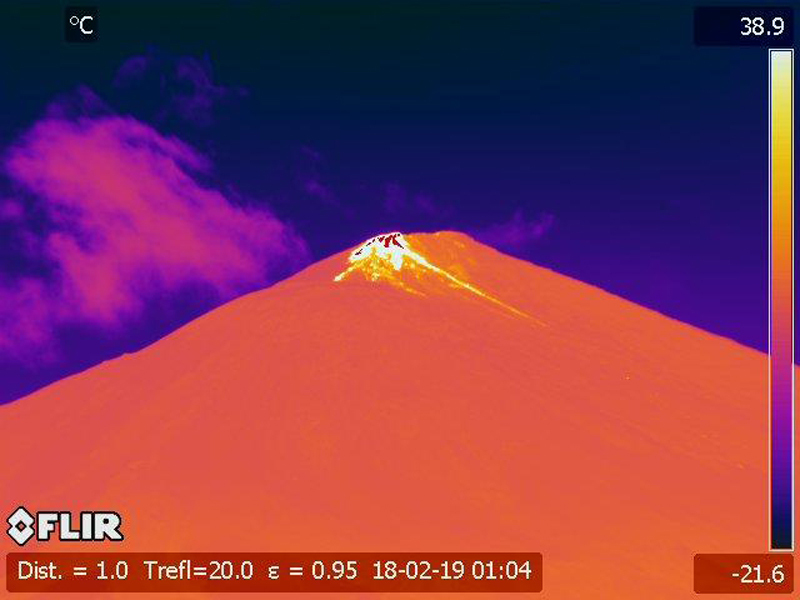 Thermal imaging data gathered during their trip indicated that the maximum temperatures of the explosions were over 500°C and that the lava flows of June and August were much cooler with temperatures ranging between 100 and 150°C (figure 80). A dense ash plume rose to more than 2,800 m above the summit and drifted N and E on 25 October (figure 81). Figure 80. 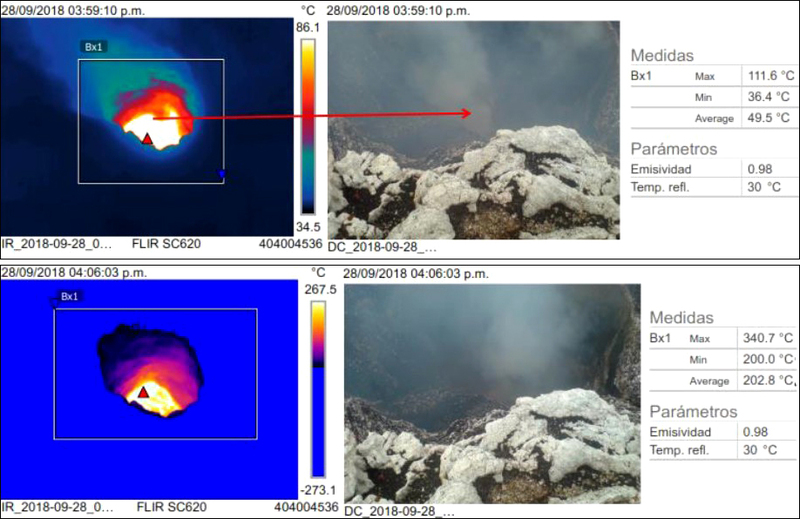 Thermal imaging at Reventador on 24 October 2017 indicated that the temperatures of explosions were over 500°C, and that the lava flows of June and August 2017 were much cooler, around 100-150°C. Image taken by M. Almeida from the Hosteria Reventador, 7.2 km SE from the summit. 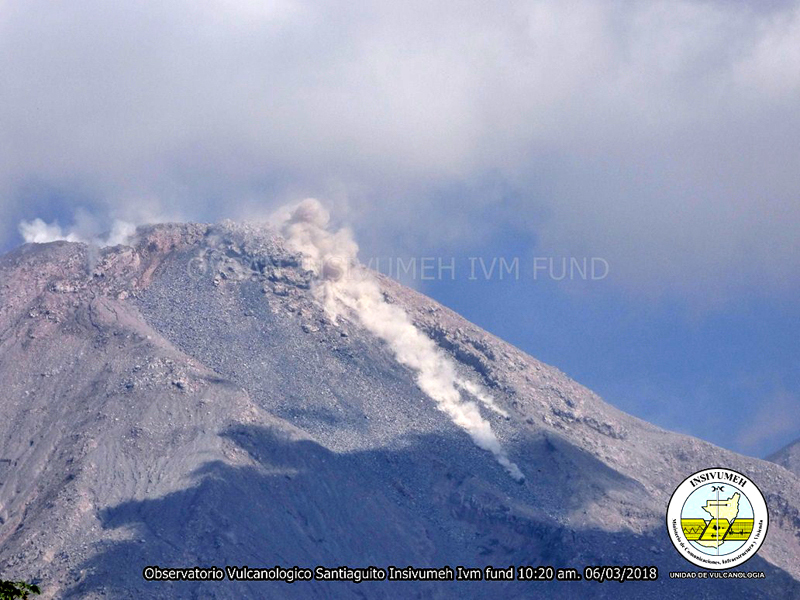 Courtesy of IGEPN (Informe Especial del Volcán El Reventador – 2017 – No. 5, Actualización de la actividad del volcán, 30 de octubre del 2017). Figure 81. A dense ash plume rose at least 2,800 m above the summit of Reventador on 25 October 2017 and drifted NE. Photo by B Bernard, courtesy of IGEPN (Informe Especial del Volcán El Reventador – 2017 – No. 5, Actualización de la actividad del volcán, 30 de octubre del 2017). The Washington VAAC reported numerous ash emissions during 24-26 October 2017 at altitudes of 5.8-6.1 km, drifting N and NE from the summit about 35 km. 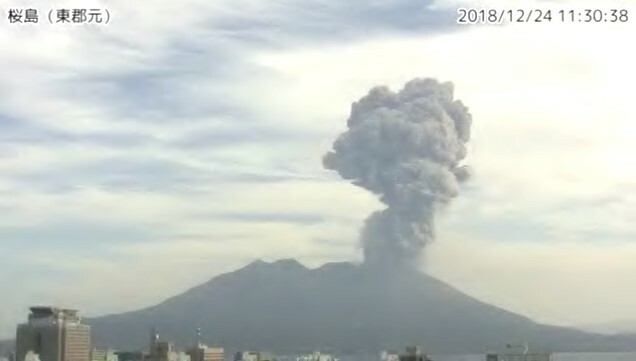 IGEPN reported continuing ash emissions beginning on 27 October that lasted for several days, including observations that day of a plume that rose to 4,900 m above the summit. The Washington VAAC reported the plume at 8.5 km altitude, the highest for the period of this report. During the last few days of October, the wind changed to the S, resulting in reports of moderate ashfall in Napo province in the towns of San Luis, San Carlos (9 km S), El Salado (14 km S), El Chaco (33 km SW), and Gonzalo Díaz de Pineda (El Bombón, 26 km SW). Persistent ash emissions continued during November 2017 along with observations of incandescence at the summit crater. Plumes of steam, gas, and ash were reported over 600 m above the summit throughout the month; the Washington VAAC issued multiple daily aviation alerts with plume heights averaging 4.3-4.9 km altitude, usually drifting W. Higher altitude plumes over 6.0 km were reported a few times with the highest during 11-12 November rising to 6.7 km. There were reports in the morning of 1 November of ashfall in Borja and San Louis (SE) and on 4 November of minor ashfall in the communities adjacent to the volcano. Incandescent blocks were seen rolling 300 m down the flanks during 7-9 November. Heavy rains on 20 November resulted in a lahar on the E flank. During 22-27 November blocks rolled as far as 800 m down all the flanks, with many on the S and SE flanks (figure 82). Figure 82. Steam, gas, and ash plumes, and incandescent blocks rolling down the flanks were common occurrences at Reventador throughout November 2017. 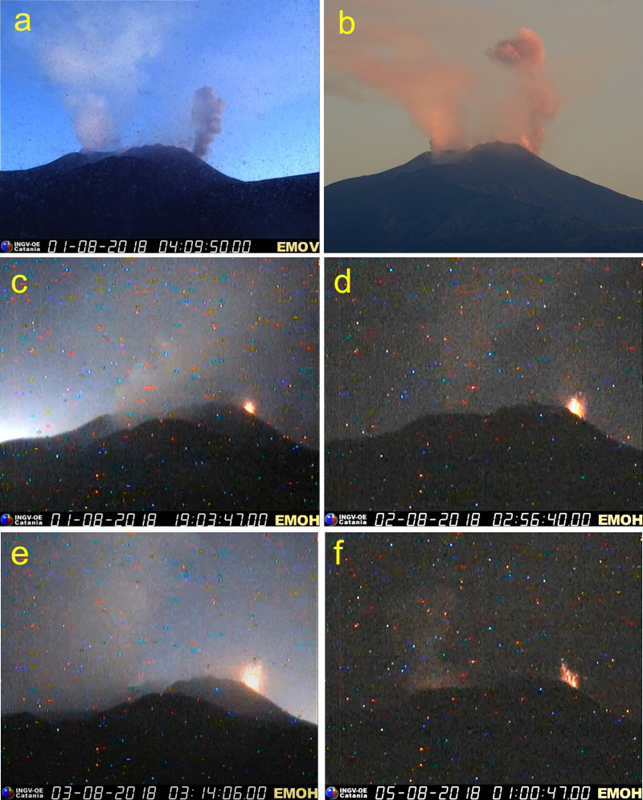 Top: An ash and steam plume on 22 November 2017 rose over 600 m and drifted W. Bottom: Incandescent blocks rolled as far as 800 m down the flanks on 23 November 2017, mostly on the S and SE flanks. 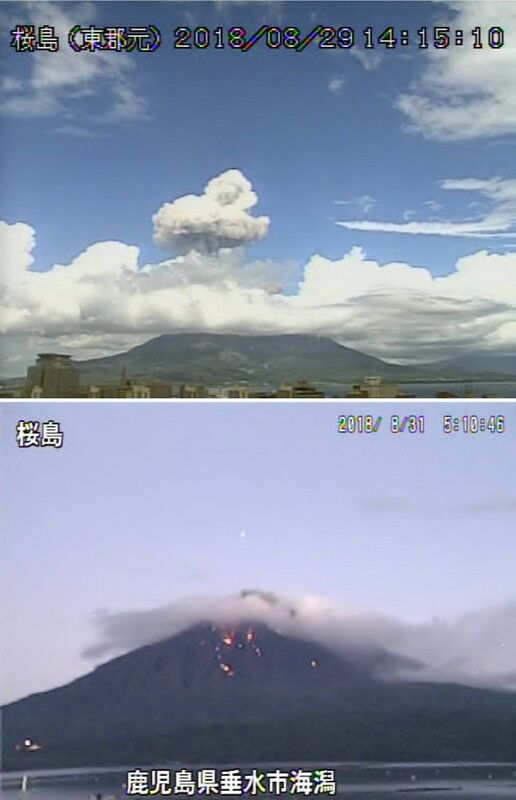 Courtesy of IGEPN webcam (Informe Diario del Estado del Volcán Reventador Nos. 2017-326, and 2017-327). Although multiple daily aviation alerts continued throughout December 2017 from the Washington VAAC, weather clouds often prevented satellite observations of the ash plumes. When visible, plume heights were generally 4-5 km altitude, drifting W or NW; the highest plume on 17 December reached 5.5 km and drifted WNW before dissipating. IGEPN noted incandescence at the summit on almost all nights it was visible; incandescent blocks traveled as far as 900 m down all the flanks on 11 December, and 400-800 m most nights. 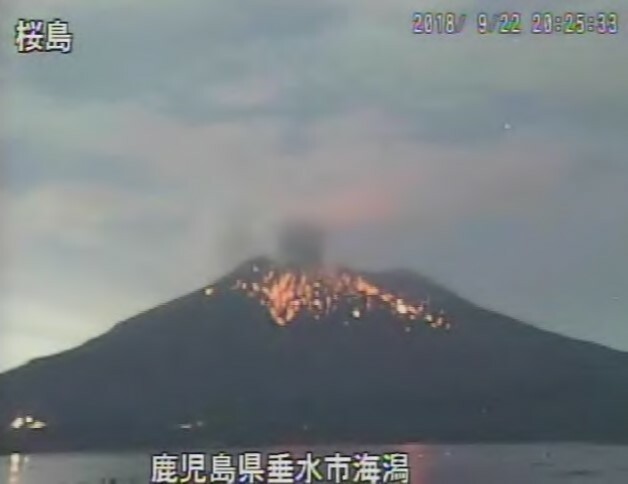 They also reported ash plumes rising more than 600 m above the summit 24 days of the month. A video of typical activity at Reventador was taken by Martin Rietze during 1-7 December 2017, along with numerous excellent photographs (figures 83-85). Figure 83. 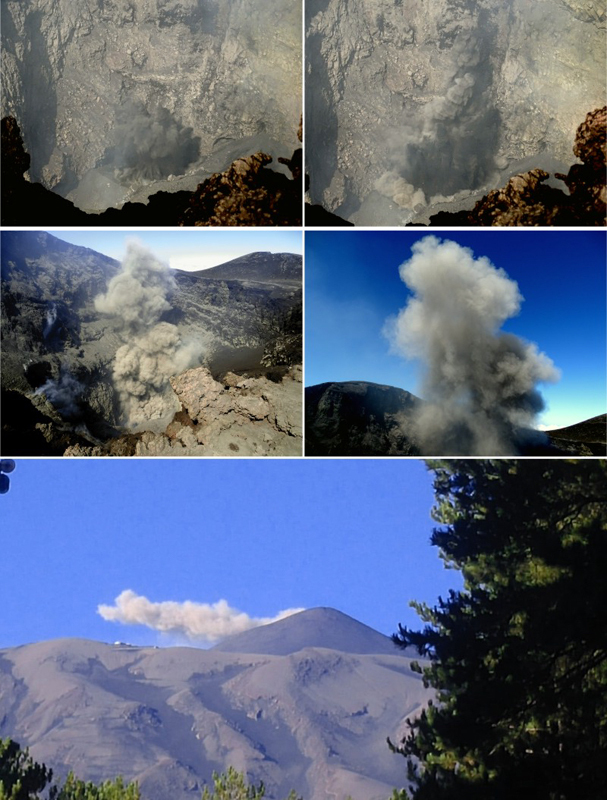 Strombolian explosions at Reventador during the first week of December 2017 sent showers of incandescent debris skyward (upper photo) before sending larger incandescent blocks hundreds of meters down the flanks of the cone (lower photo) while a dense ash plume rose from the summit area. Photographs taken during 1-7 December 2017, copyright by Martin Rietze and used with permission. Figure 84. 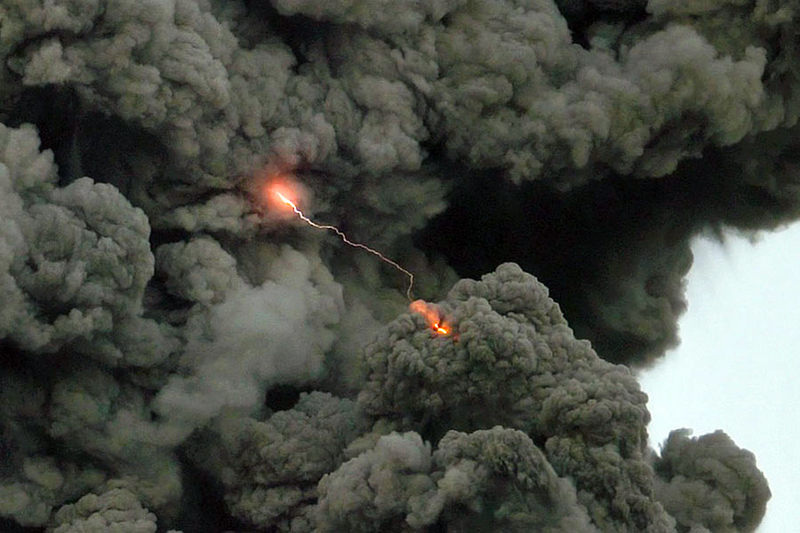 Lightning strikes were photographed within the dense ash plumes that rose from the summit of Reventador during the first week of December 2017. Photograph copyright by Martin Rietze and used with permission. Figure 85. 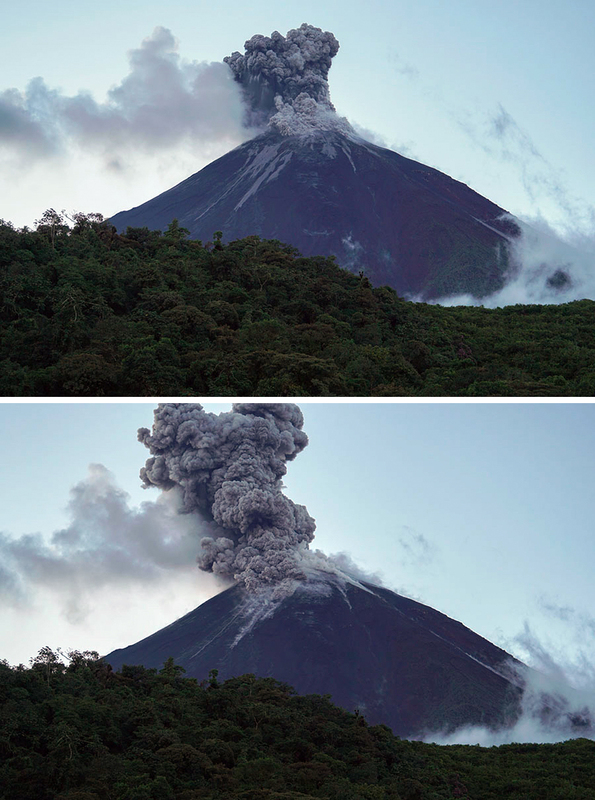 Explosions at Reventador during the first week of December 2017 produced dense ash plumes and small pyroclastic flows down multiple flanks. 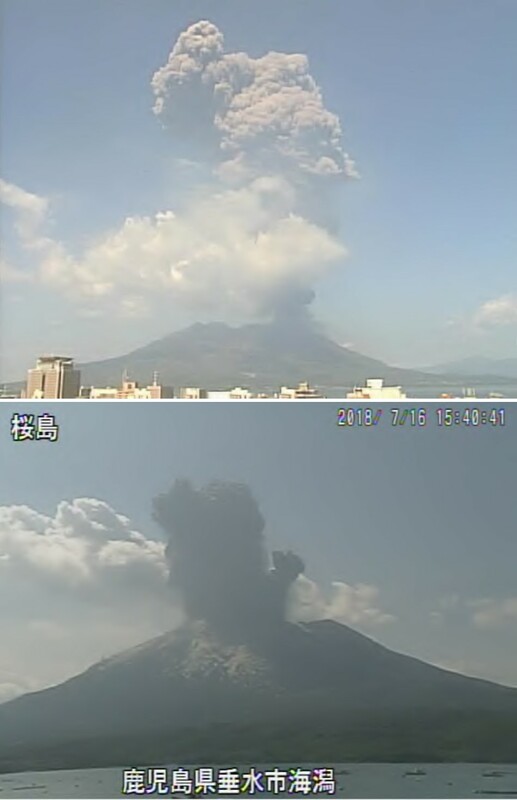 The flanks were bare at the beginning of the ash emission event (upper photo) but small pyroclastic flows can be seen descending the flanks a few moments later (lower photo). Photograph taken during 1-7 December 2017, copyright by Martin Rietze and used with permission. Activity during January-March 2018. Except for several cloudy days during the third week of January 2018 when no observations were possible, IGEPN reported recurring emissions of steam, gas, and ash rising over 600 m and drifting mostly W or NW throughout the month. During 11-12 January ash plumes briefly drifted E. Incandescent block avalanches were reported most often traveling 200-400 m down the S and SE flanks; a few times they travelled up to 800 m down all the flanks. Other than the cloudy days of 20-24 January, the Washington VAAC issued multiple daily aviation alerts. When ash plumes were visible in satellite imagery, plume altitudes ranged from 4.3-4.9 km, except for 30-31 January when they were reported at 5.2 km (figure 86). Figure 86. Ash plumes and incandescent blocks were reported numerous times at Reventador during January 2018. Top left: Steam, gas, and ash were reported rising over 600 m and drifting NW and E on 2 January. Top right: on 3 January, the drift directions of the steam, gas, and ash plumes were W and NE. Lower left: Incandescent blocks were reported travelling 800 m down all the flanks on 12 January. Lower right: Ash plumes on 30 January were reported by the Washington VAAC at 5.2 km altitude, the highest during the month; they drifted N and W. Courtesy of IGEPN (Informe Diario del Estado del Volcán Reventador, Nos. 2018-2, 2018-3, 2018-12, and 2018-30). Multiple daily aviation alerts continued from the Washington VAAC throughout February 2018. While daily plume heights mostly averaged 4.3-4.9 km altitude, there were a greater number of higher-altitude ash plumes than during recent months. A plume on 5 February was reported at 6.1 km drifting 15 km N and a plume the following day drifted 30 km ENE at 7.6 km altitude. A plume on 16 February rose to 5.5 km and drifted 55 km NW; one on 22 February rose to 7.0 km and drifted almost 100 km SE before dissipating. The next day, a plume rose to 5.5 km and drifted 35 km SE. Two separate plumes were observed in satellite imagery drifting NE on 25 February, the first rose to 5.5 km and drifted 110 km and the second rose to 6.4 km and drifted 45 km before dissipating. 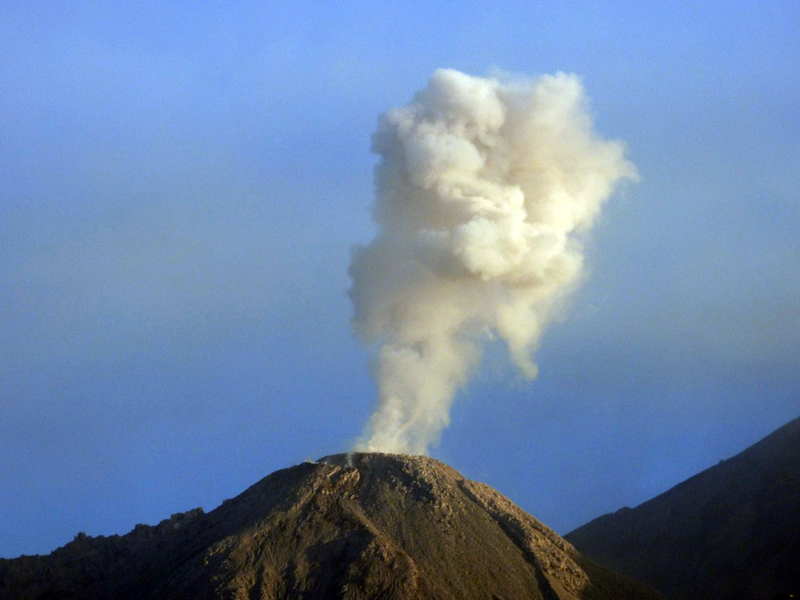 IGEPN reported a plume of steam, gas, and ash on 27 February that rose over 1,000 m above the summit and drifted NE. Although IGEPN only reported incandescent avalanche blocks on 11 days in February, more likely occurred because the view was obscured by weather clouds for 14 days of the month. 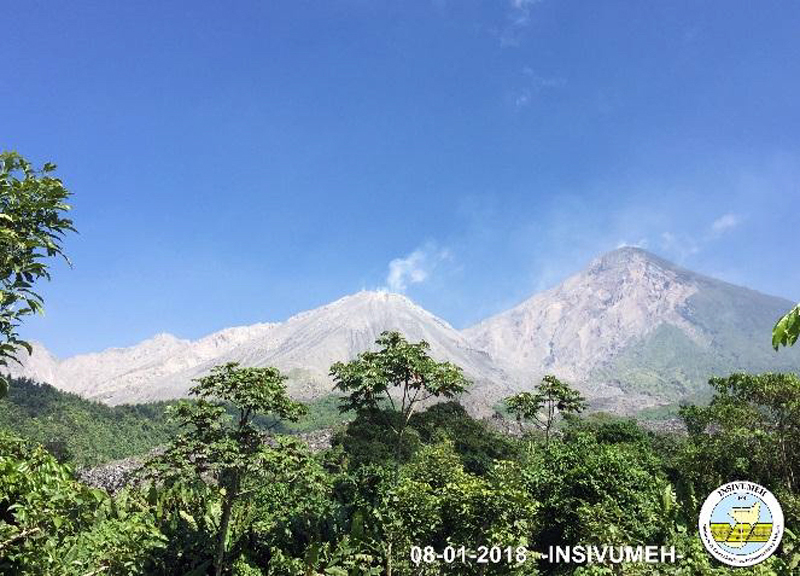 Minor ashfall in the vicinity of the volcano was reported by IGEPN on 1 March 2018. They also noted steam and gas plumes containing moderate amounts of ash that rose over 2,000 m above the summit and drifted SW and S that day (figure 87). IGEPN reported ash emissions around 600 m or higher above the summit on 21 days during the month. In addition to persistent incandescent activity at the summit, avalanche blocks rolled down all the flanks 800 m numerous times. 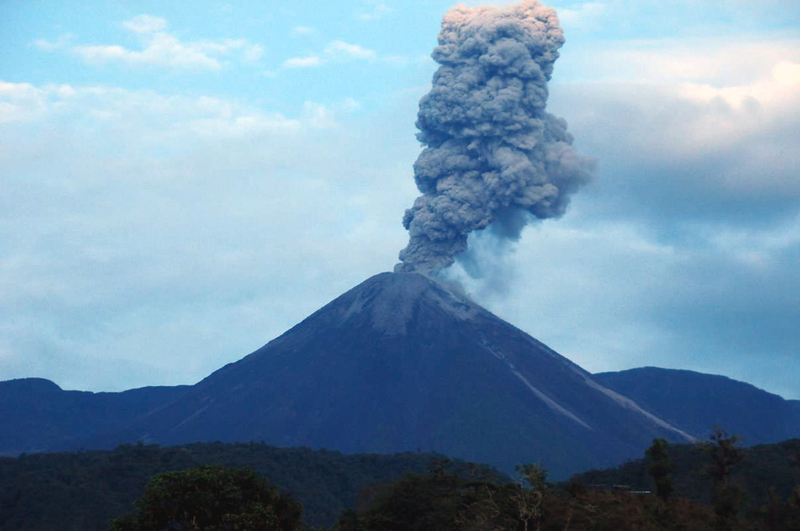 A pyroclastic flow was reported 400 m down the S flank on 13 March (figure 88). Incandescent blocks rolled 1,000 m down all the flanks on 22 March. Other than a plume reported in satellite imagery at 5.8 km moving E on 26 March, all of the ash plumes reported by the Washington VAAC during March ranged from 3.9-4.9 km altitude and generally drifted NW or W.
Figure 87. 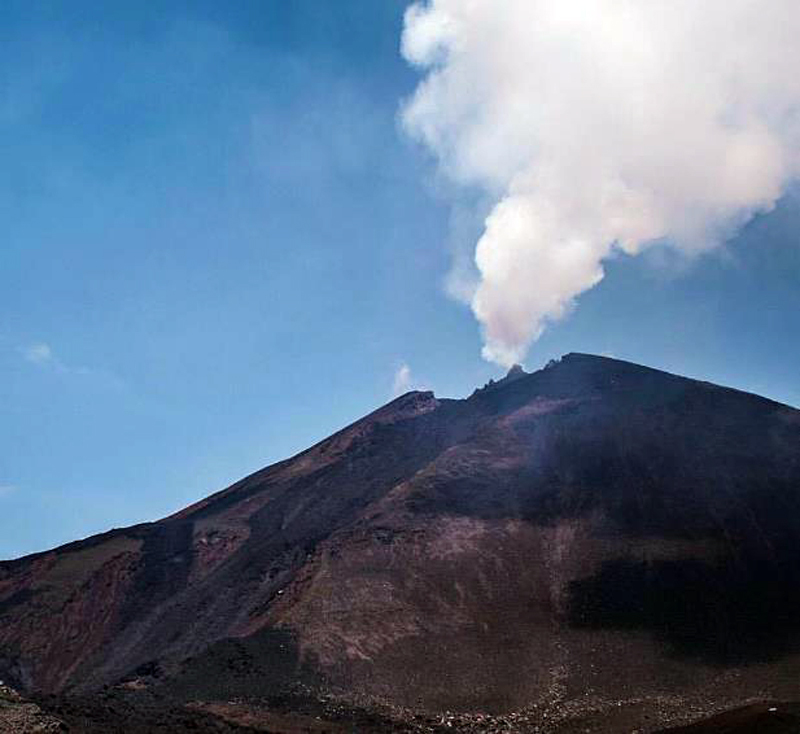 A plume of steam, gas, and ash rose from Reventador on 1 March 2018; IGEPN reported it as rising over 2,000 m above the summit and drifting SW and S. A small pyroclastic flow also appeared to descend the flank. 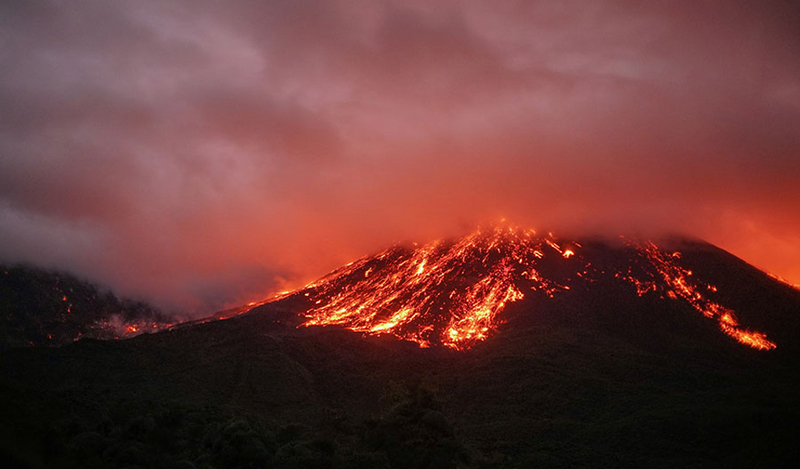 Courtesy of IGEPN (Informe Diario del Estado del Volcán Reventador, No. 2018-60). Figure 88. 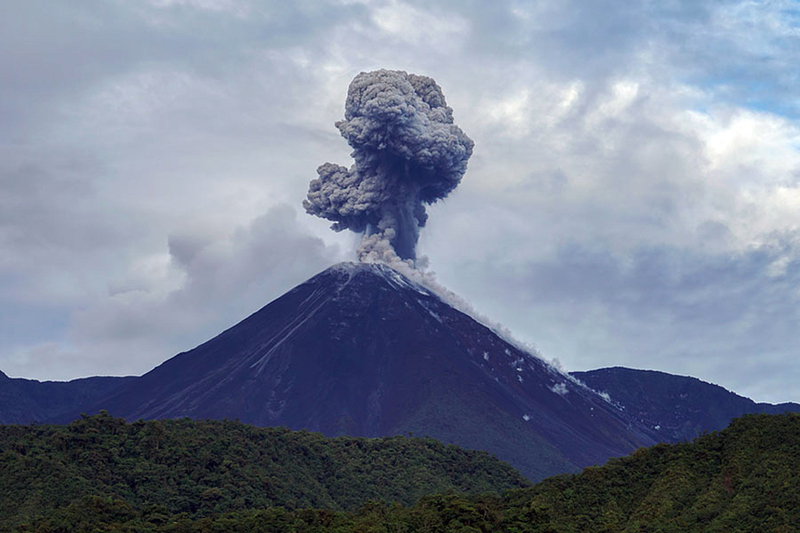 Continued explosions at Reventador during March 2018 produced abundant incandescent avalanche blocks, ash plumes, and a few pyroclastic flows. Top: Abundant incandescent blocks rolled 800 m down all the flanks on 6 March 2018. Bottom: An ash plume rose over 600 m above the summit and drifted NW while a pyroclastic flow traveled 400 m down the S flank on 13 March 2018. Courtesy of IGEPN (Informe Diario del Estado del Volcán Reventador, Nos. 2018-65 and 2018-72). Information Contacts: Instituto Geofísico, Escuela Politécnica Nacional (IGEPN), Casilla 17-01-2759, Quito, Ecuador (URL: http://www.igepn.edu.ec/); Washington Volcanic Ash Advisory Center (VAAC), Satellite Analysis Branch (SAB), NOAA/NESDIS OSPO, NOAA Science Center Room 401, 5200 Auth Rd, Camp Springs, MD 20746, USA (URL: www.ospo.noaa.gov/Products/atmosphere/vaac, archive at: http://www.ssd.noaa.gov/VAAC/archive.html); Hawai'i Institute of Geophysics and Planetology (HIGP) - MODVOLC Thermal Alerts System, School of Ocean and Earth Science and Technology (SOEST), Univ. of Hawai'i, 2525 Correa Road, Honolulu, HI 96822, USA (URL: http://modis.higp.hawaii.edu/); MIROVA (Middle InfraRed Observation of Volcanic Activity), a collaborative project between the Universities of Turin and Florence (Italy) supported by the Centre for Volcanic Risk of the Italian Civil Protection Department (URL: http://www.mirovaweb.it/); Martin Rietze (URL: http://mrietze.com/web16/Ecuador17.htm). 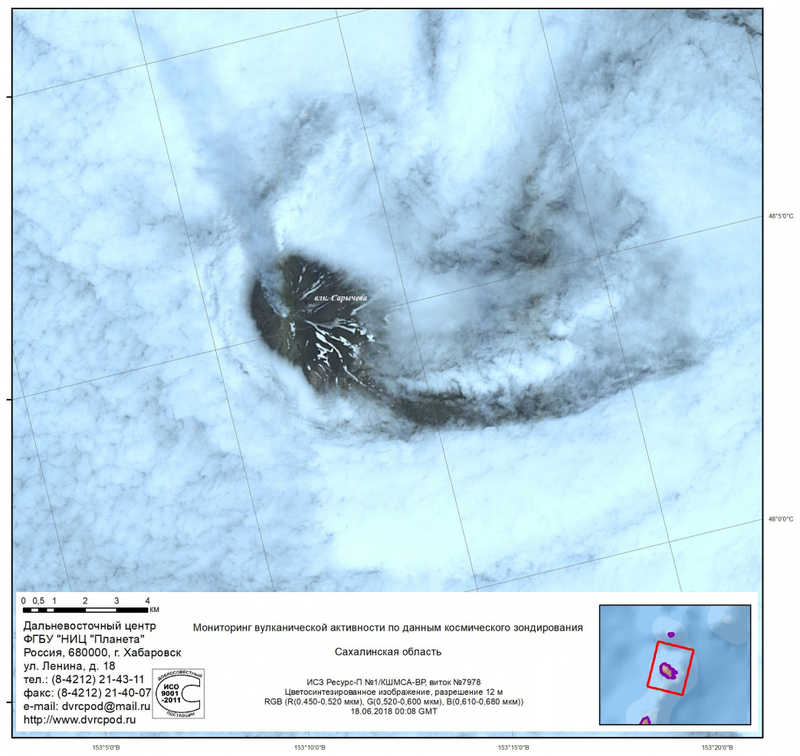 An eruption at Sheveluch has been ongoing since 1999, and volcanic activity was previously described through January 2018 (BGVN 43:02). 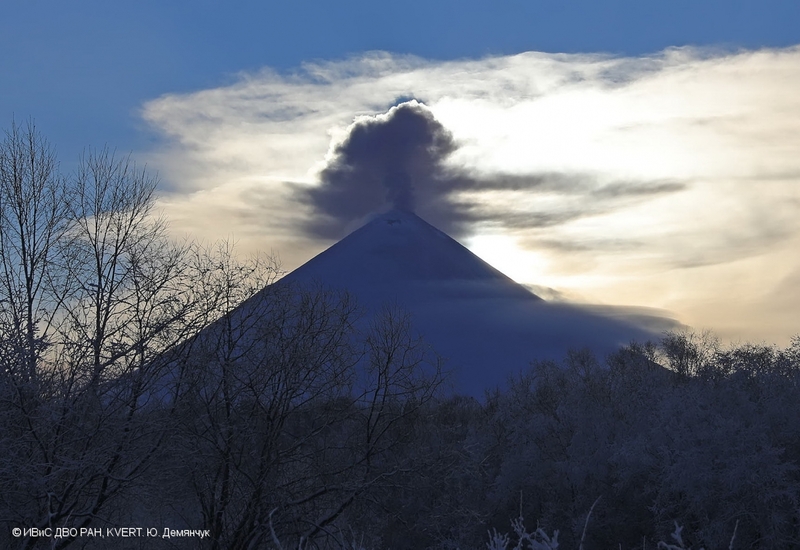 Ongoing activity has consisted of pyroclastic flows, explosions, and lava dome growth with a viscous lava flow in the N. According to the Kamchatka Volcanic Eruption Response Team (KVERT), moderate emissions of gas-and-steam have continued, and ash explosions up to 10-15 km in altitude could occur at any time. The Aviation Color Code remained at Orange (the second highest level on a four-color scale) throughout this reporting period from February through April 2018. KVERT reported continuous moderate gas-and-steam plumes from Sheveluch during February-April 2018 (figure 49). 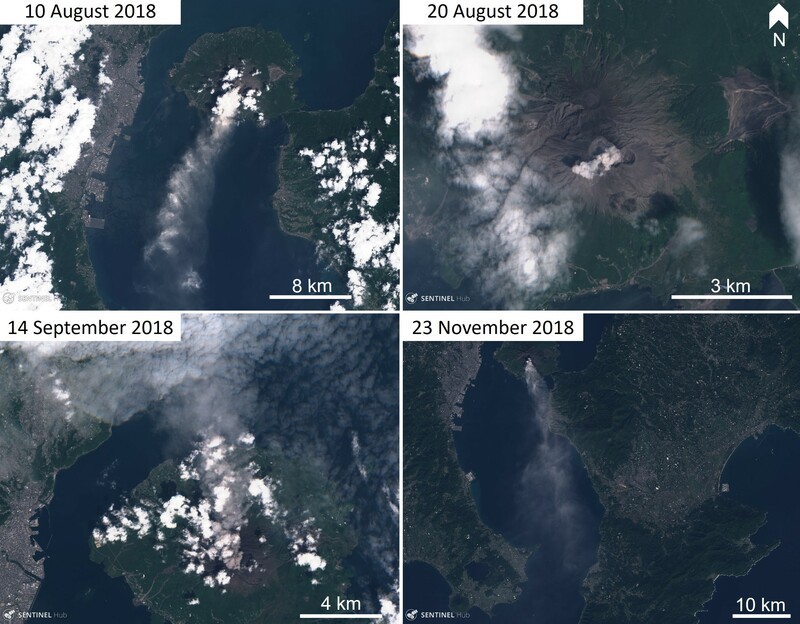 Satellite imagery interpreted by KVERT showed a thermal anomaly over the volcano on 13 days during February, 21 days in March, and 15 days in April. Cloud cover obscured satellite imagery the remainder of the time during this reporting period. Figure 49. Photo of the lava dome at Sheveluch on 25 March 2018. Courtesy of Yu. 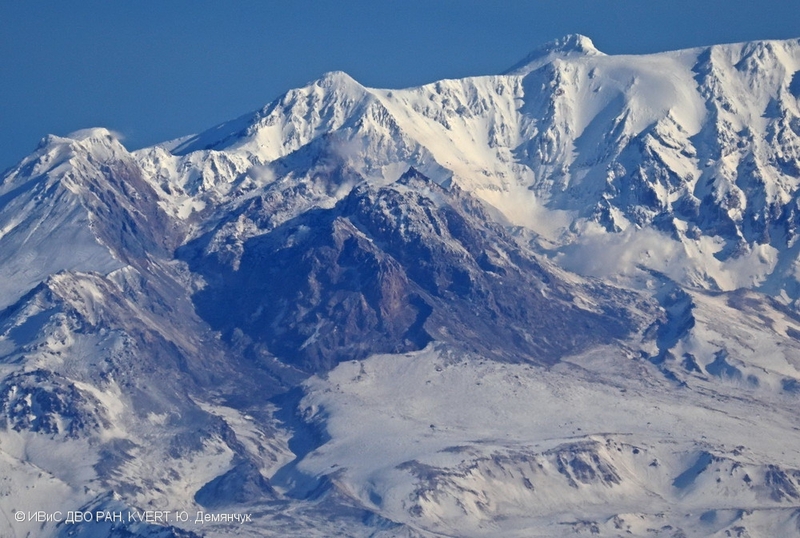 Demyanchuk (IVS FEB RAS, KVERT). The MIROVA system detected intermittent low-power thermal anomalies from February through April 2018. Thermal anomalies, based on MODIS satellite instruments analyzed using the MODVOLC algorithm, were not detected during this period. 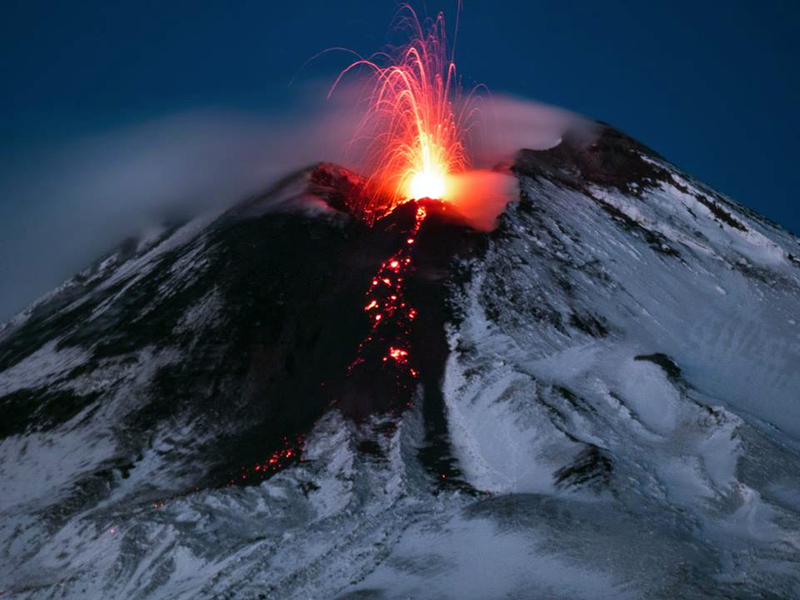 Information Contacts: Kamchatka Volcanic Eruptions Response Team (KVERT), Far East Division, Russian Academy of Sciences, 9 Piip Blvd., Petropavlovsk-Kamchatsky, 683006, Russia (URL: http://www.kscnet.ru/ivs/kvert/); Institute of Volcanology and Seismology, Far Eastern Branch, Russian Academy of Sciences (IVS FEB RAS), 9 Piip Blvd., Petropavlovsk-Kamchatsky 683006, Russia (URL: http://www.kscnet.ru/ivs/eng/); Hawai'i Institute of Geophysics and Planetology (HIGP) - MODVOLC Thermal Alerts System, School of Ocean and Earth Science and Technology (SOEST), Univ. of Hawai'i, 2525 Correa Road, Honolulu, HI 96822, USA (URL: http://modis.higp.hawaii.edu/); MIROVA (Middle InfraRed Observation of Volcanic Activity), a collaborative project between the Universities of Turin and Florence (Italy) supported by the Centre for Volcanic Risk of the Italian Civil Protection Department (URL: http://www.mirovaweb.it/).